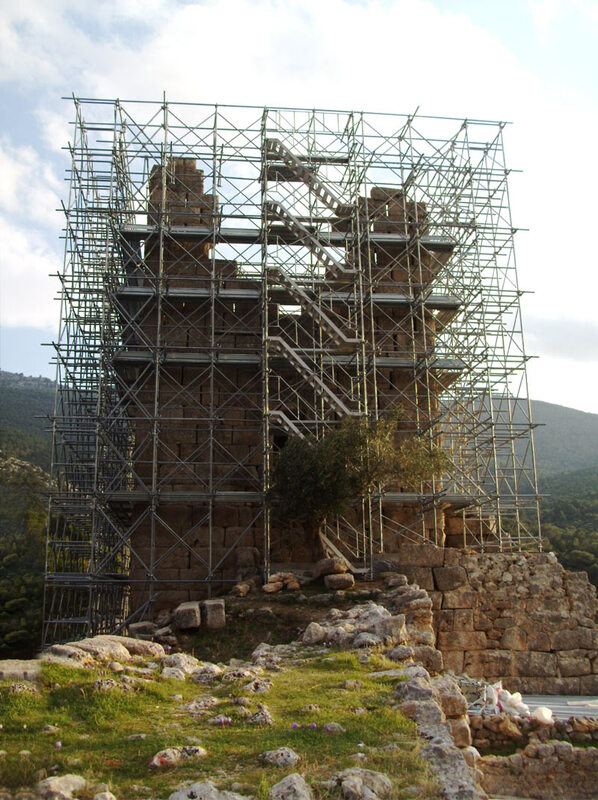 The metal scaffolding industry C. HOUNTOUMADIS S.A. was founded by Konstantinos Hountoumadis back in 1975. 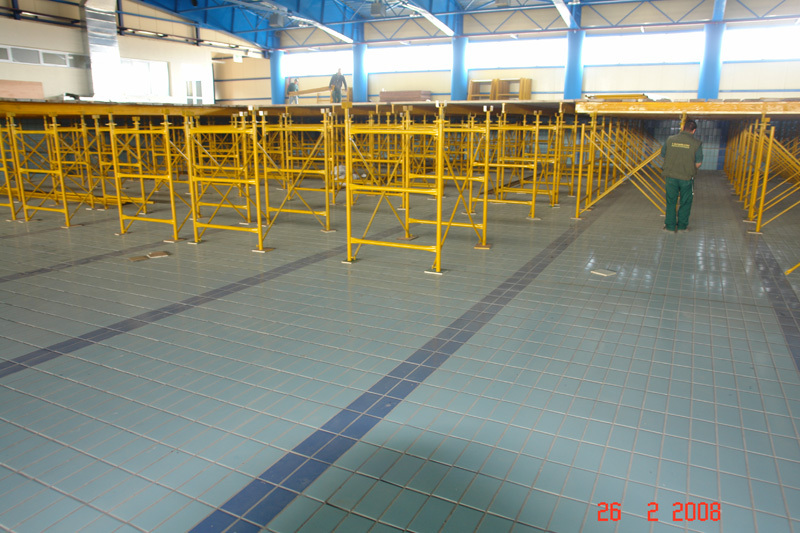 C. HOUNTOUMADIS S.A. provides all her products not only for selling but for renting purposes as well. 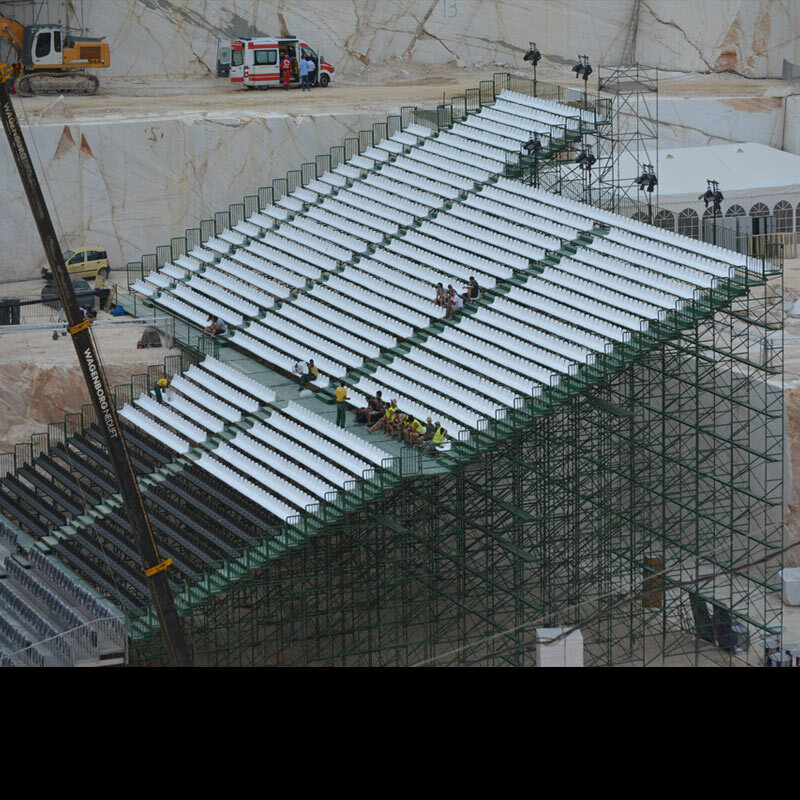 Settling, hiring and disassembling metal scaffolds for the needs of the construction site of the Stavros Niarchos Foundation Cultural Center. 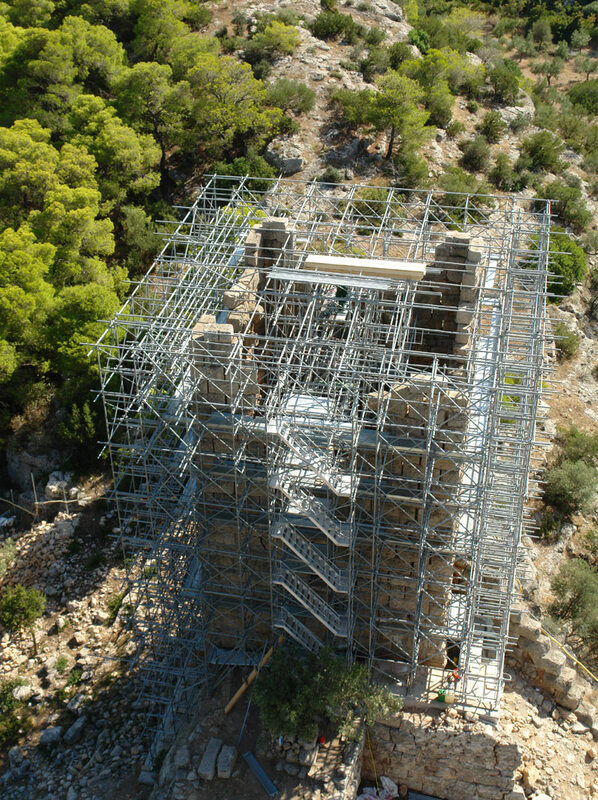 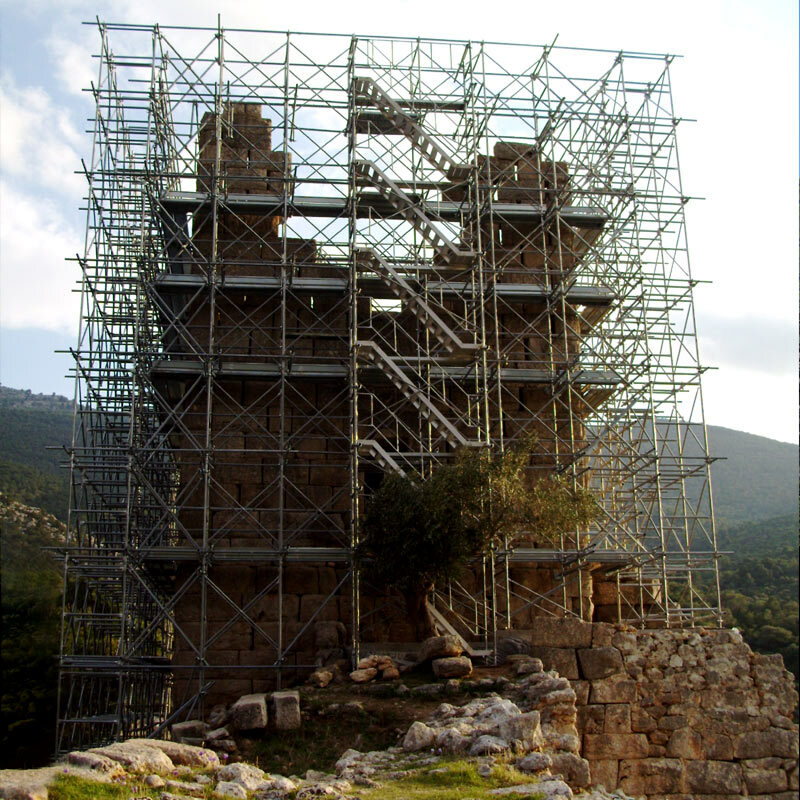 Selling and settling of metal galvanized scaffolding with Tow Bridge on top of it for the act of supporting and restoration of the NE Tower of the Ancient Fortress of Aegosthena. 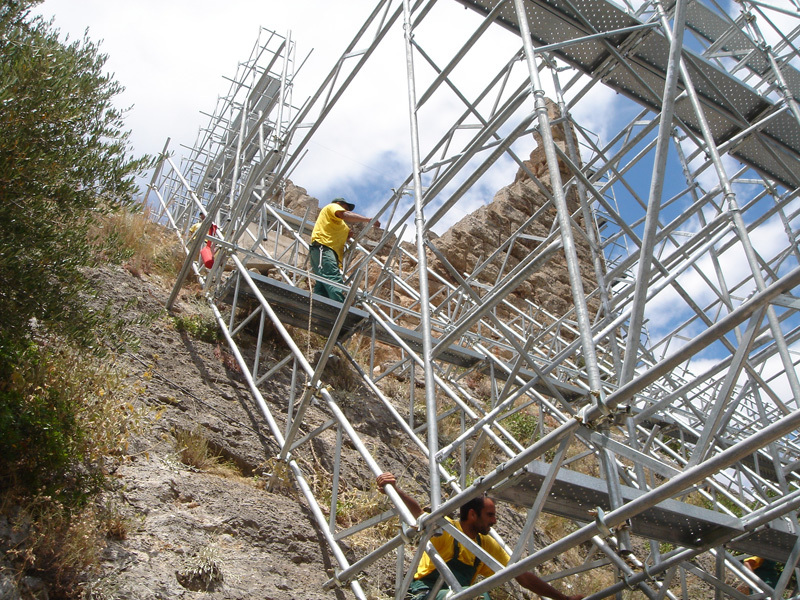 Selling and settling metal galvanized scaffoldings for the support of the SE Tower of the Ancient Fortress of Aegosthena. 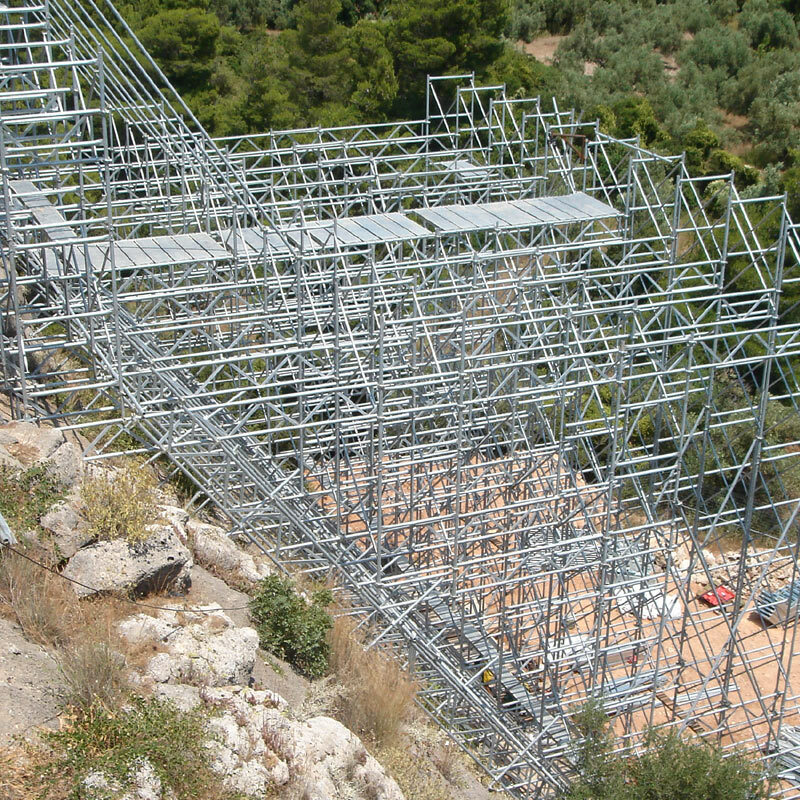 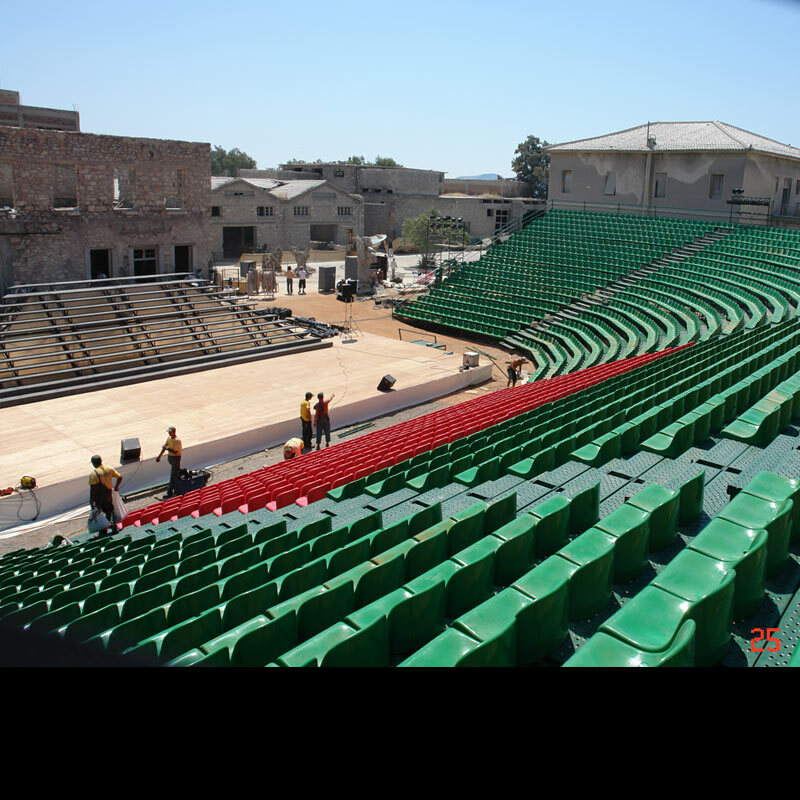 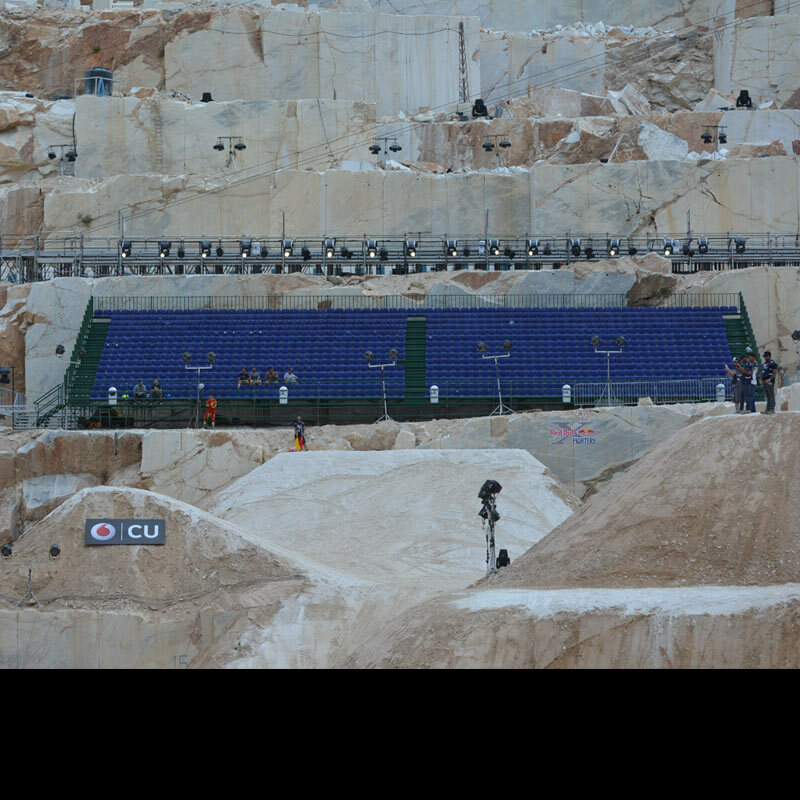 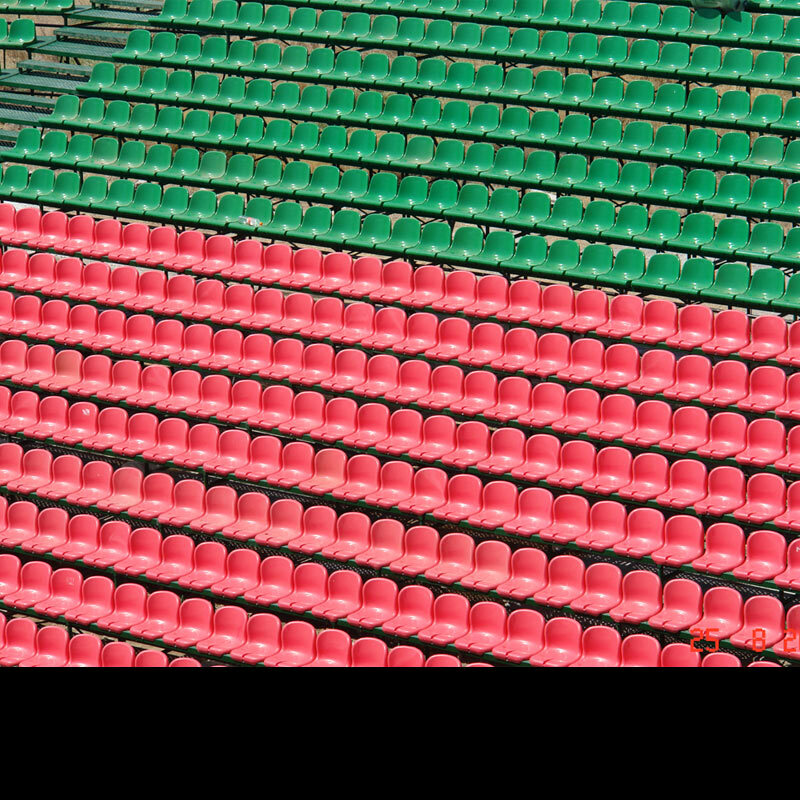 C. HOUNTOUMADIS S.A. constructs and offers for selling or renting a wide range of metal products as scaffoldings, tribunes stages and special constructions for Greece and abroad. 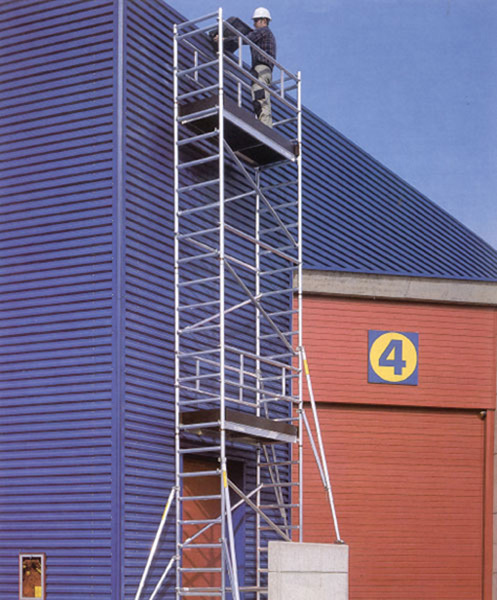 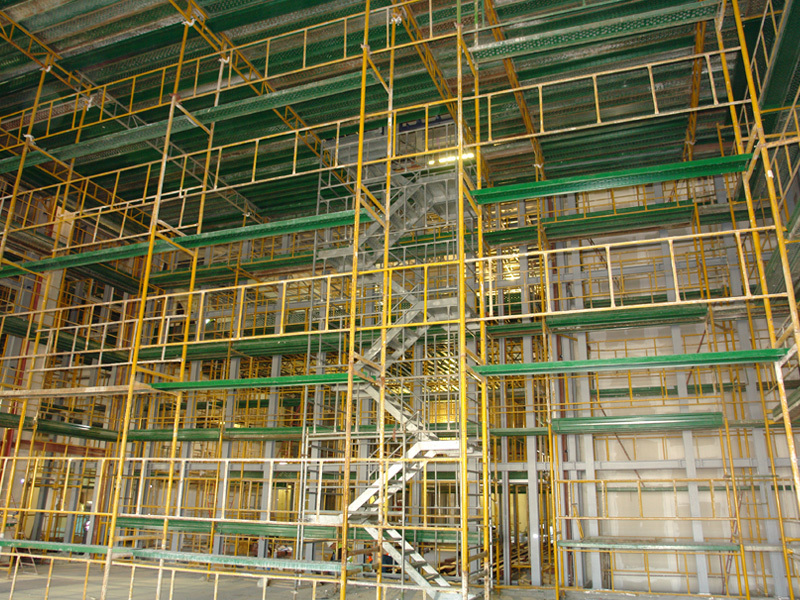 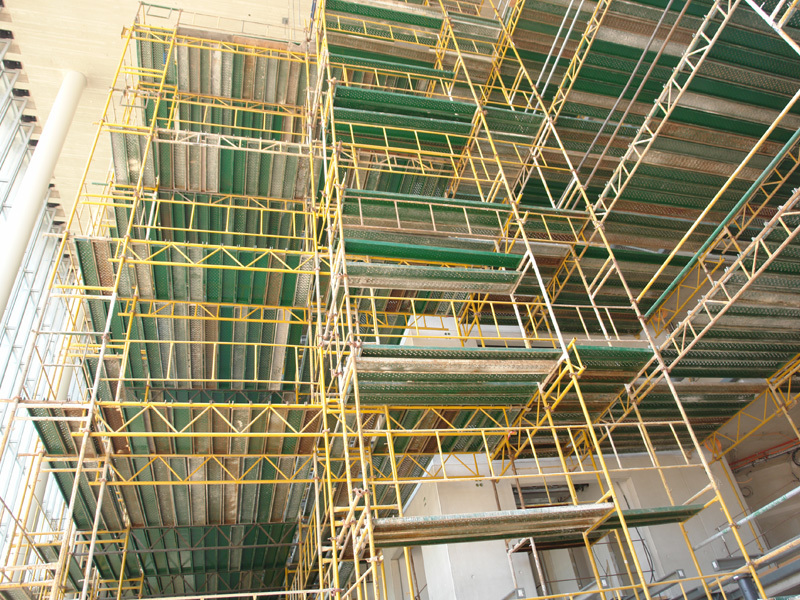 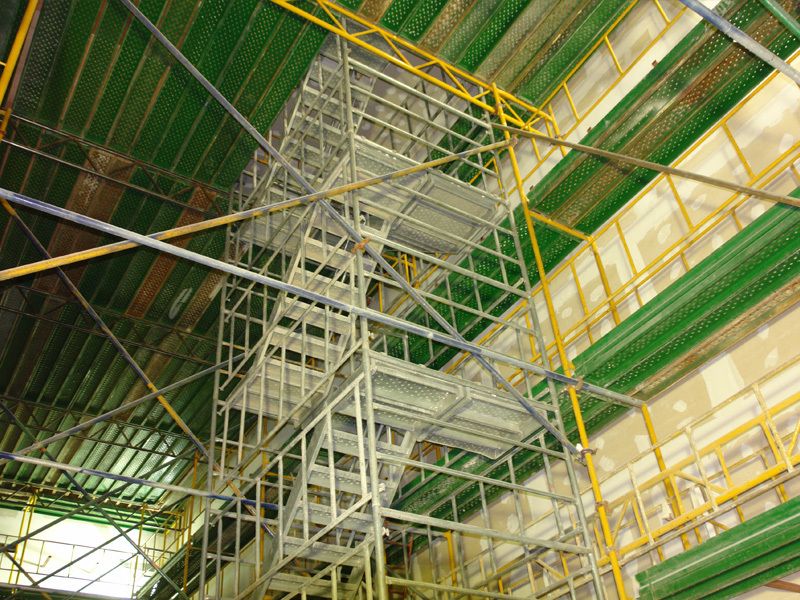 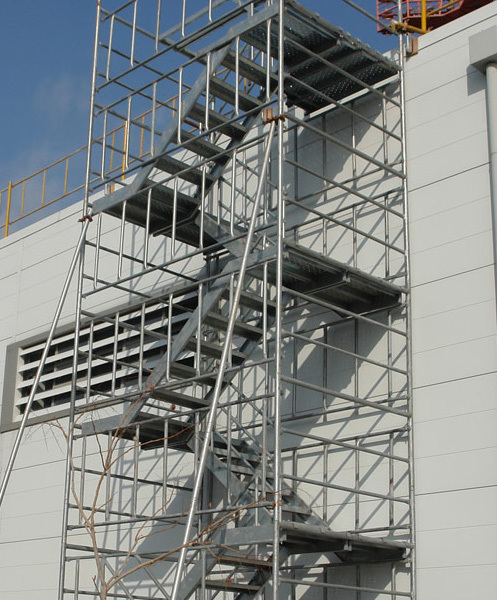 Metal Scaffolding Systems in modern standards. 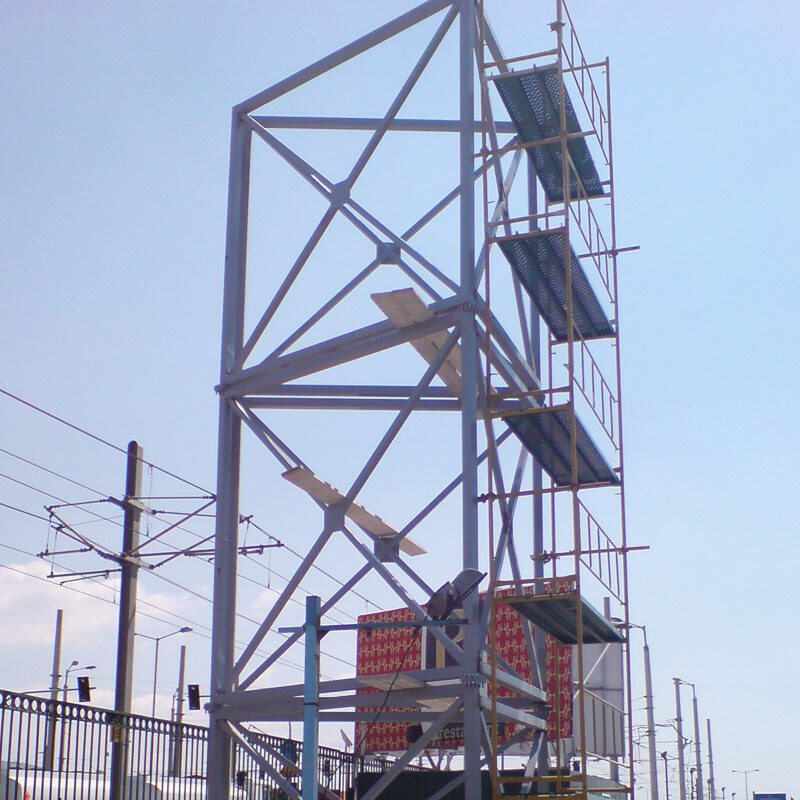 Aluminium Scaffolds in modern standards. 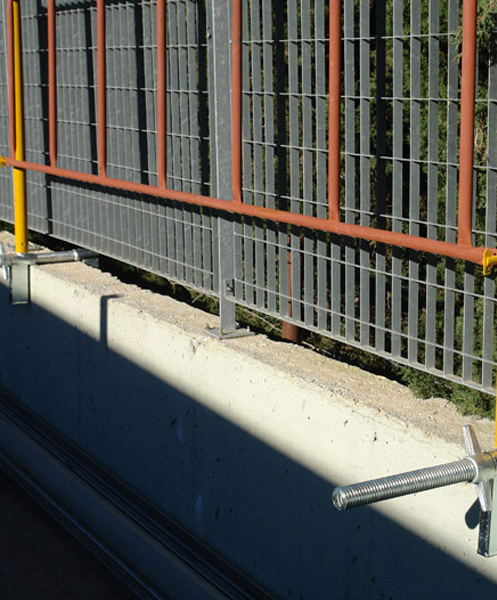 Safety guardrail systems in modern standards. 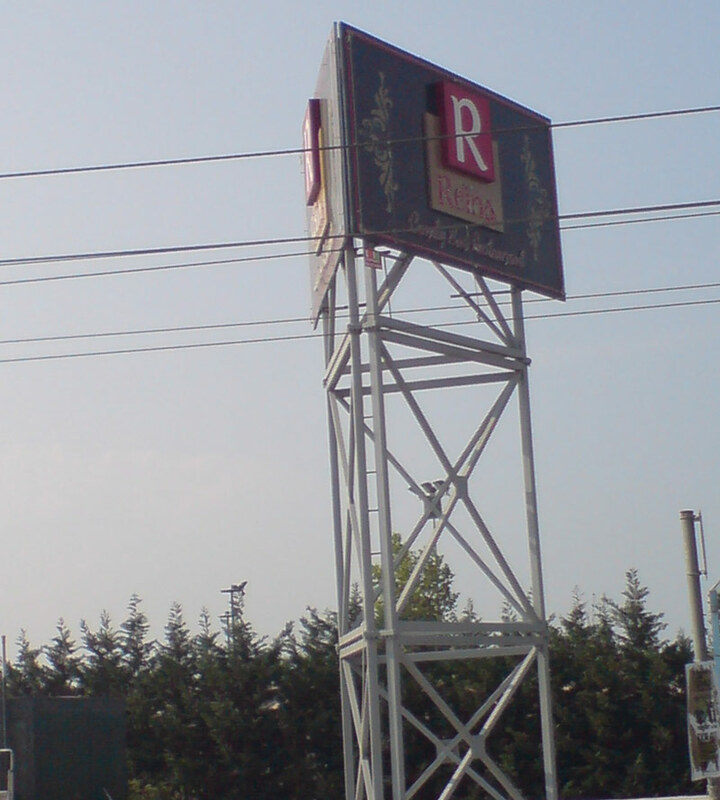 C. HOUNTOUMADIS S.A. provides all her products not only for selling but for renting purposes as well. 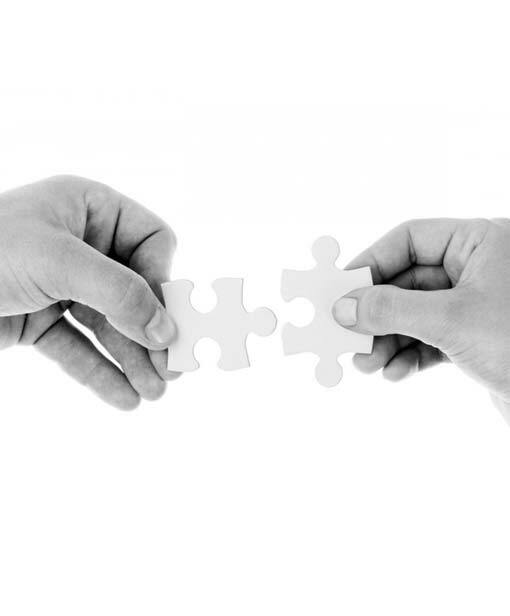 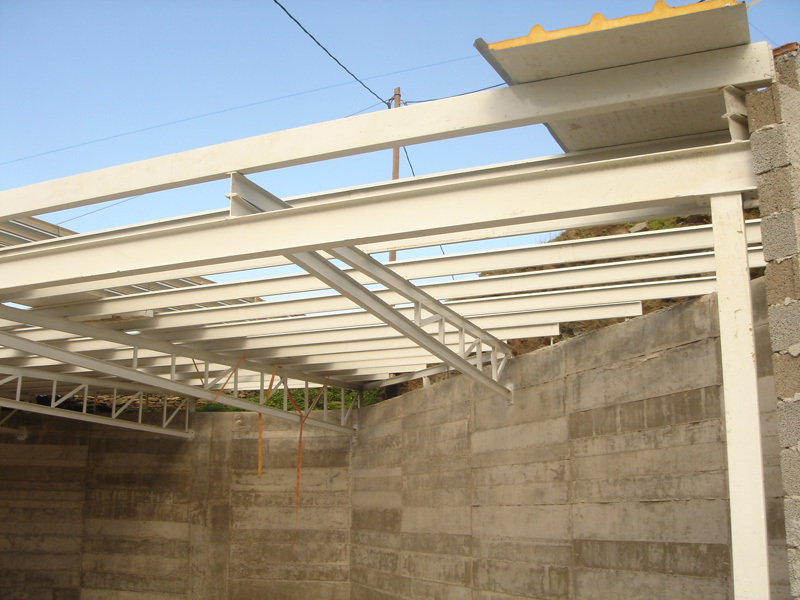 When needed the company offers her services regarding the static study of a project, the supervision of it and its maintenance. 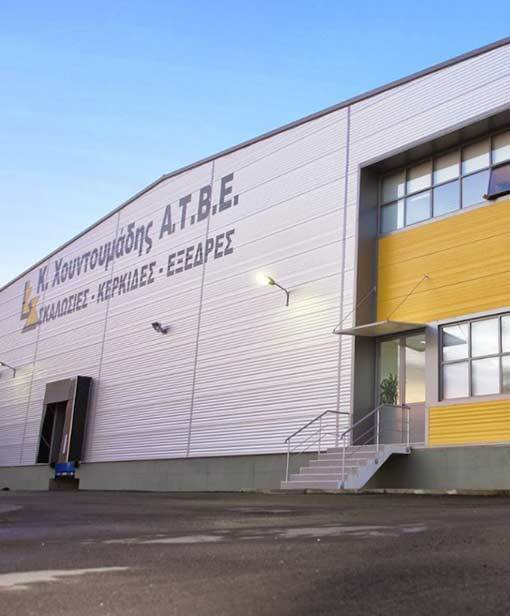 C. HOUNTOUMADIS S.A. provides high quality After Sale Service. 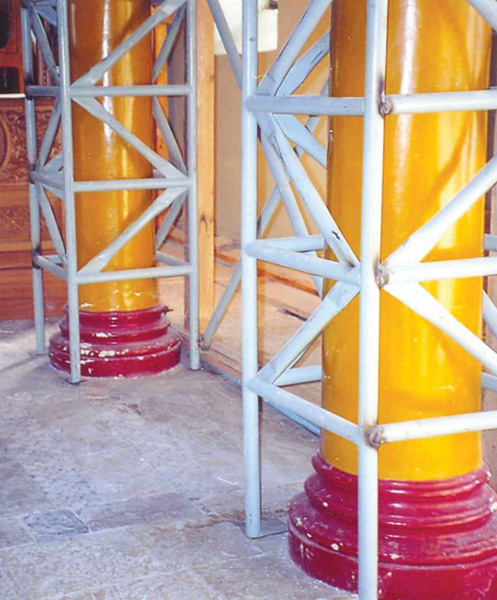 The company offers detailed explanation of the erection instructions not only while delivering its products but at any time this is needed by its customers. 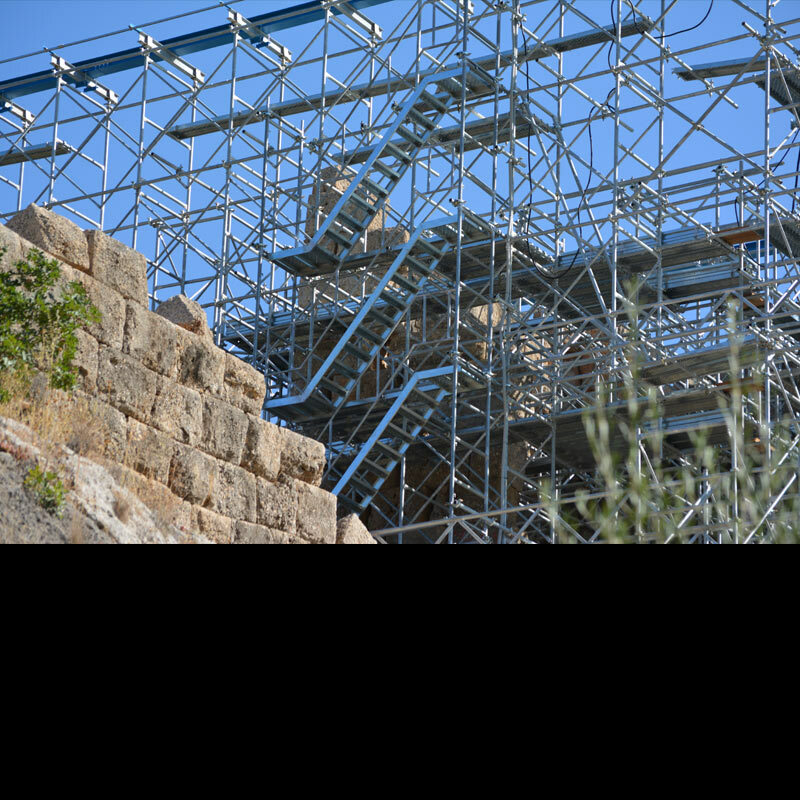 PROJECT: Settling, hiring and disassembling metal scaffolds for the needs of the construction site of the Stavros Niarchos Foundation Cultural Center. 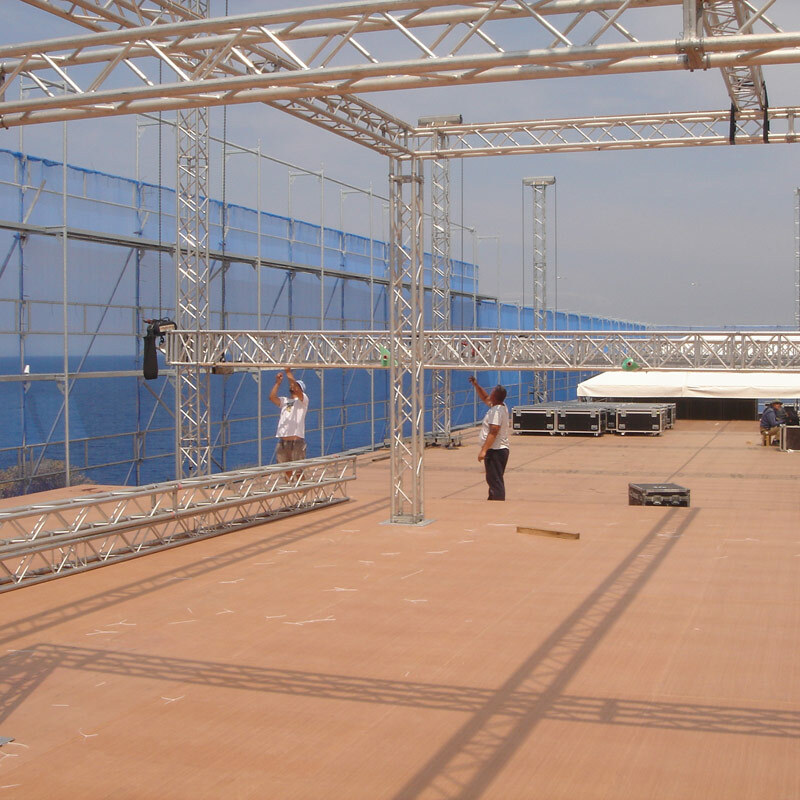 Our company, with its experienced working personnel and the support of the production unit, is able to respond to the site’s needs. 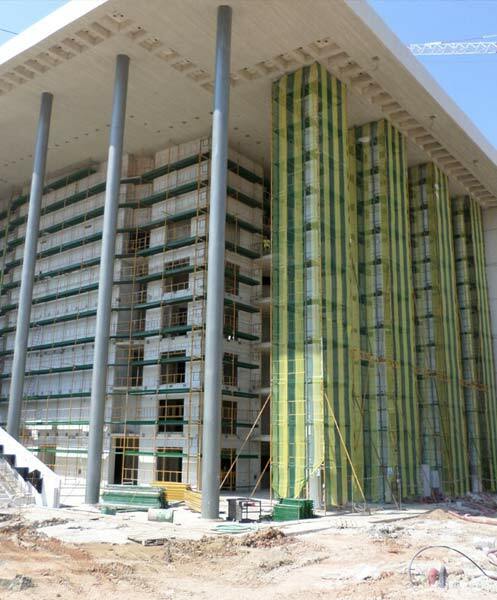 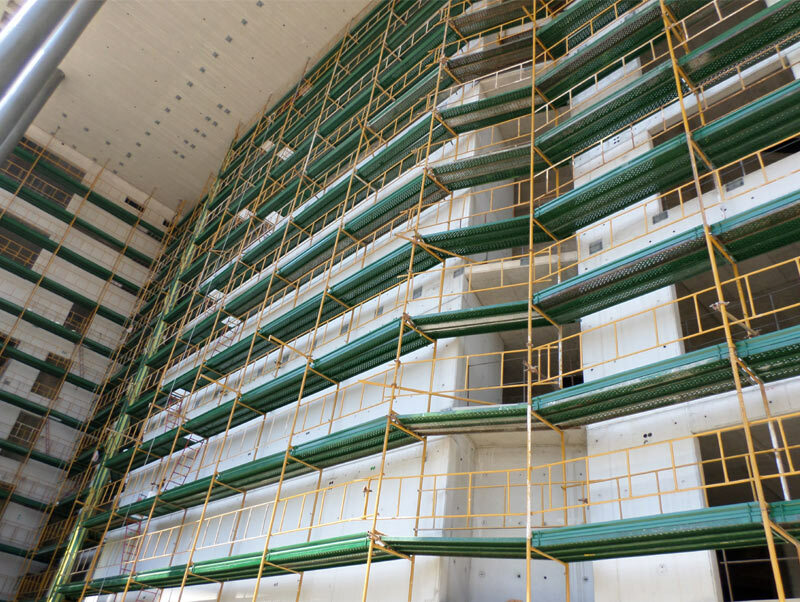 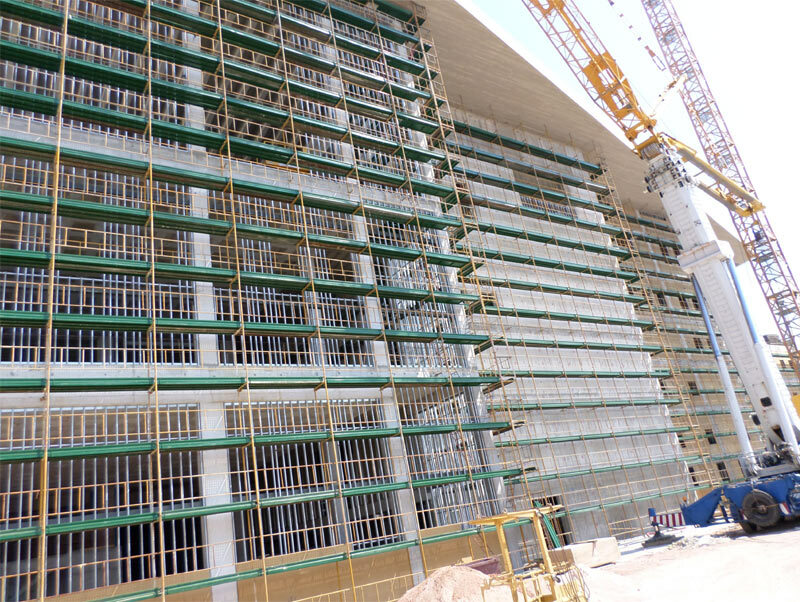 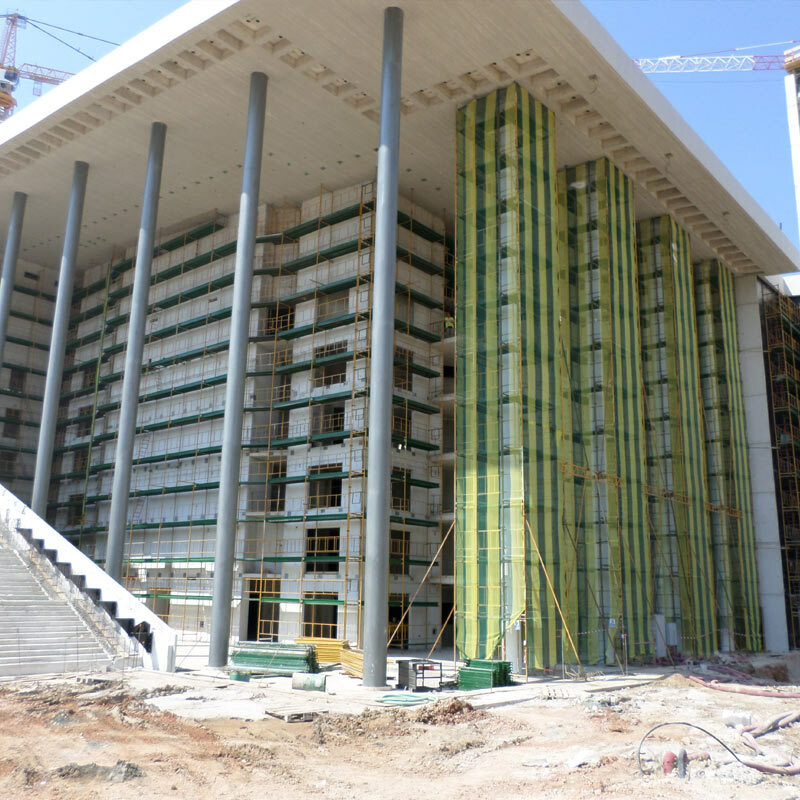 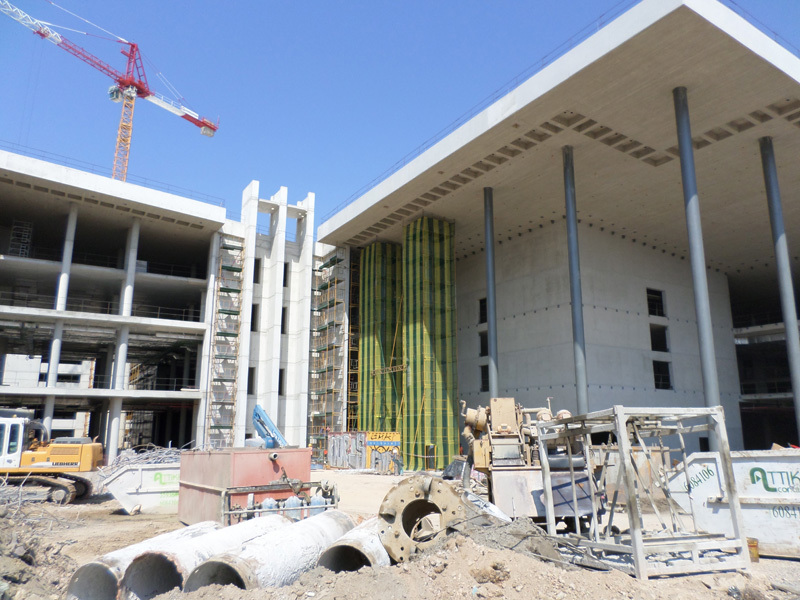 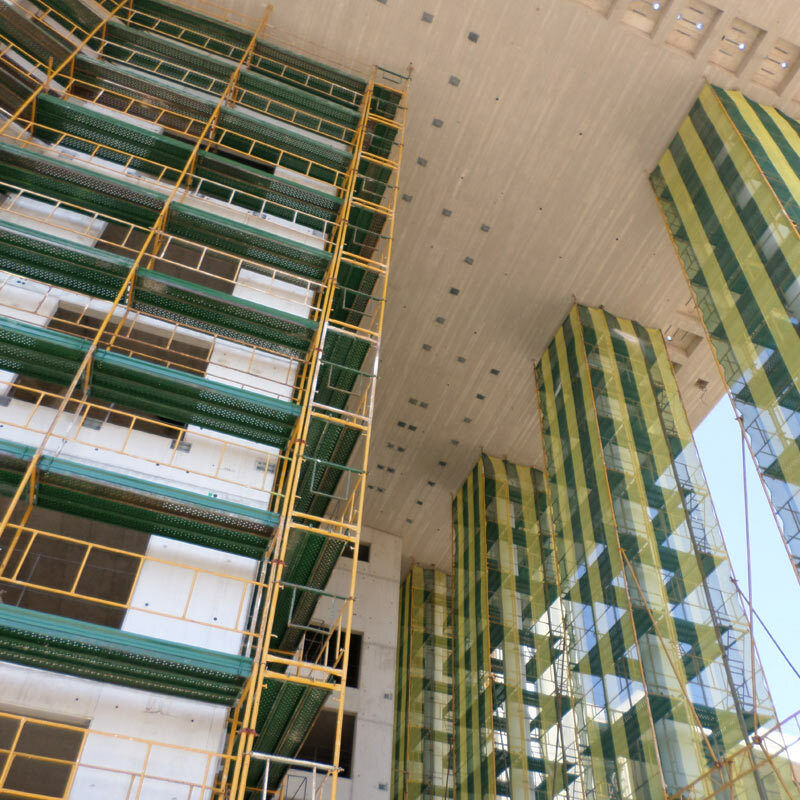 The installation of the scaffoldings, both at inner points of the Opera Building or the Library and outer points with great height, is being done in such time that causes no delays to the time schedule of the whole project. 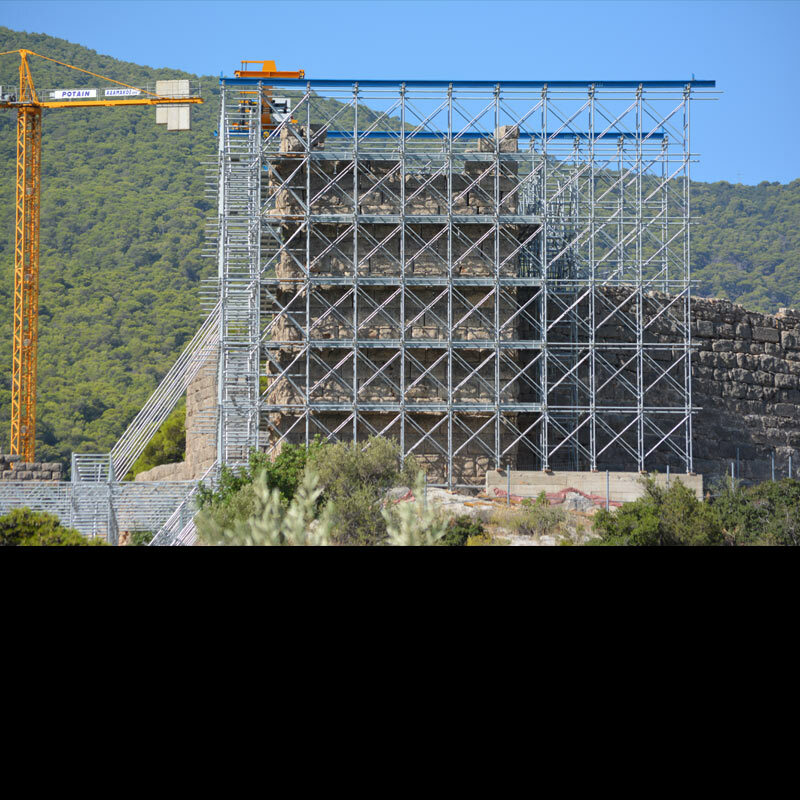 PROJECT: Selling and settling of metal galvanized scaffolding with Tow Bridge on top of it for the act of supporting and restoration of the NE Tower of the Ancient Fortress of Aegosthena. 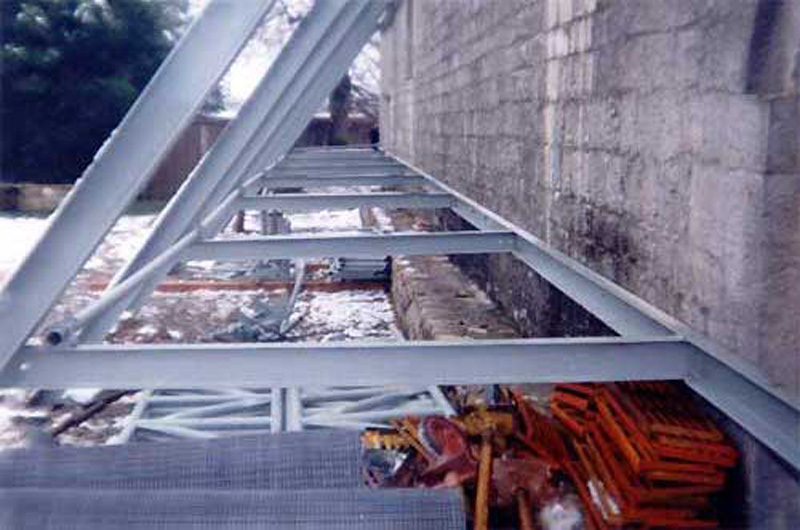 Both inside and outside of the Tower were placed metal galvanized scaffolds with the necessary working decks, while on top of the scaffoldings a Tow Bridge was installed. 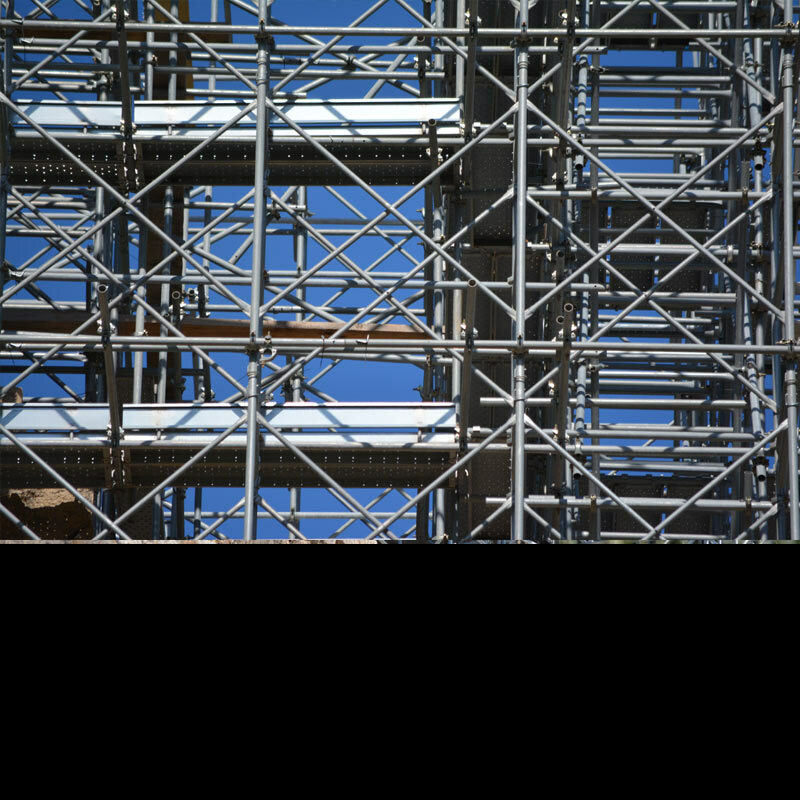 On the Eastern side of the Tower, due to the large surface inclination, a metallic construction was placed made out of metal frames and lattice elements in order to provide enough support to the Tower’s outside scaffolding. 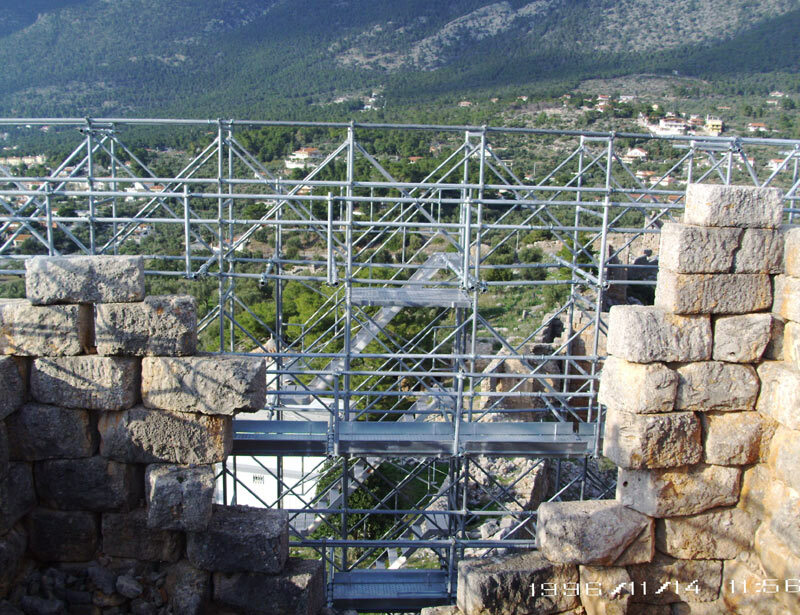 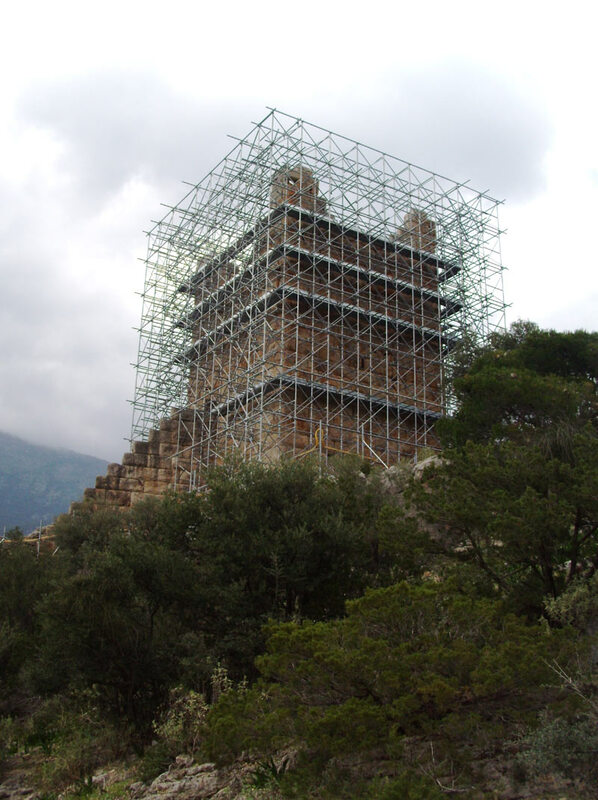 PROJECT: Selling and settling metal galvanized scaffoldings for the support of the SE Tower of the Ancient Fortress of Aegosthena. 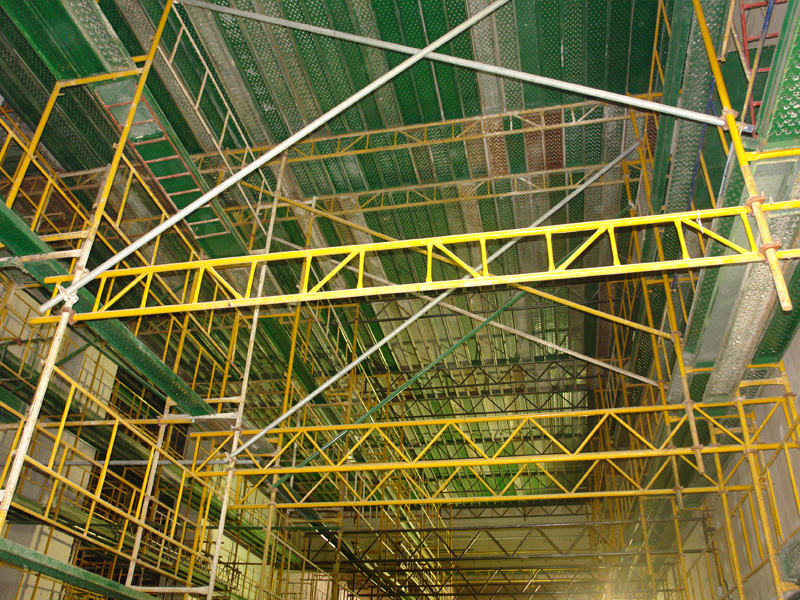 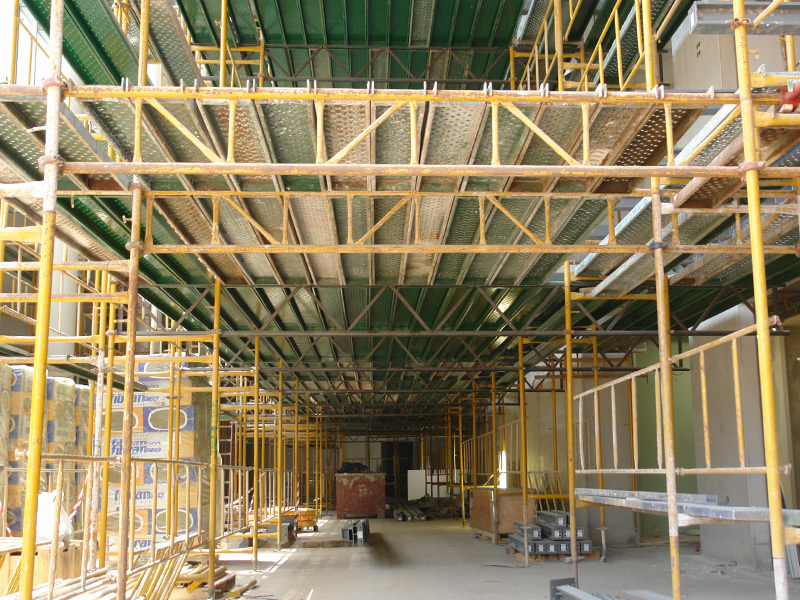 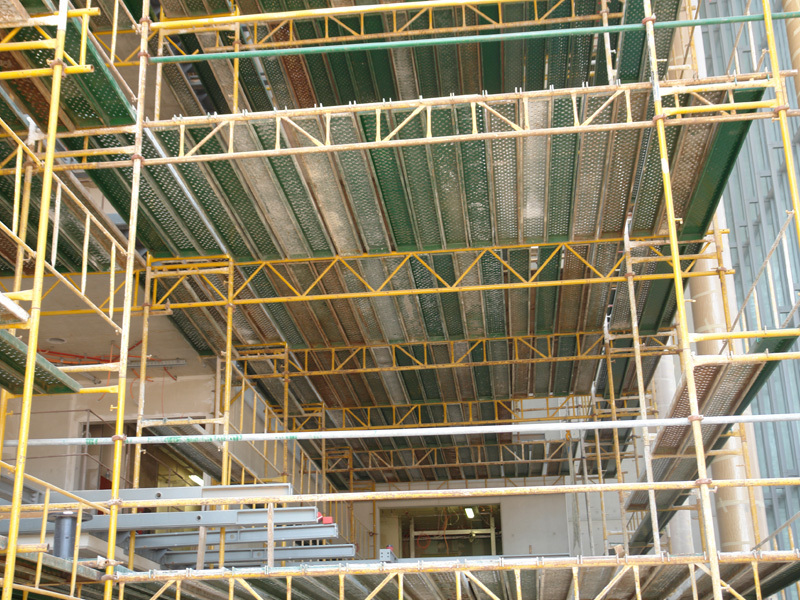 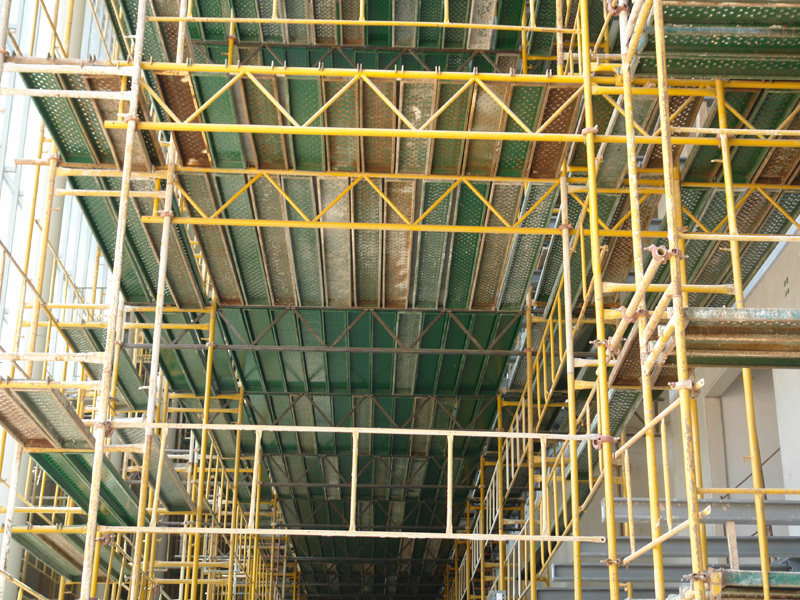 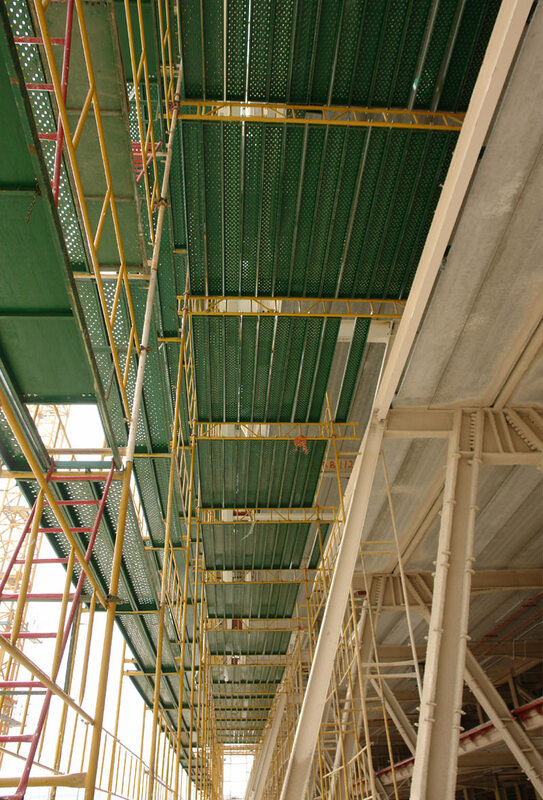 The galvanized metal scaffoldings were installed in two phases. 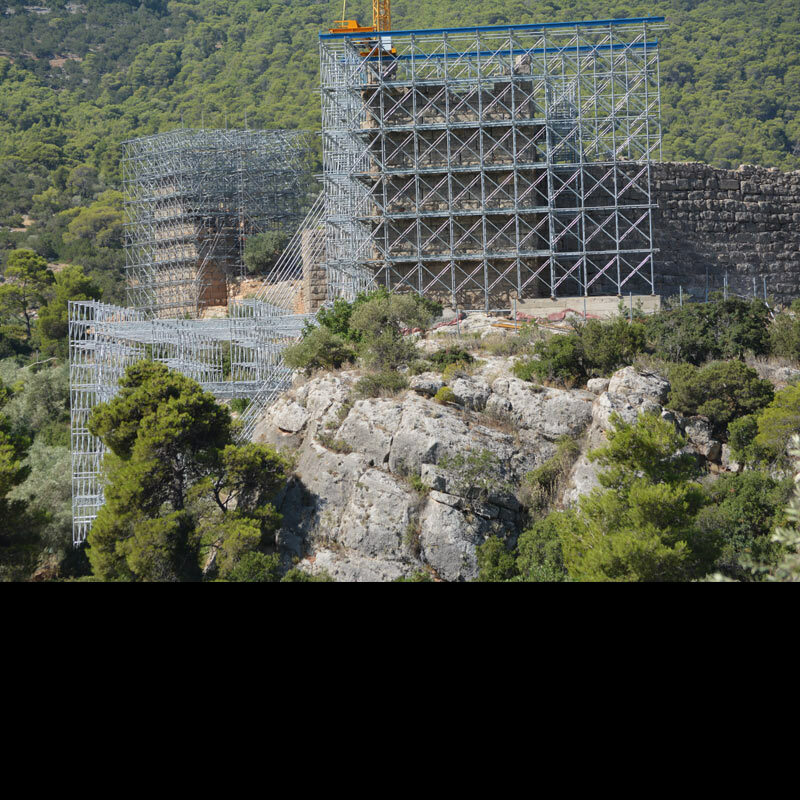 During the first one, the scaffoldings for the outer walls around the Tower were placed, while during the second one the inner scaffoldings were installed along with the necessary staircases, working decks and toe boards. 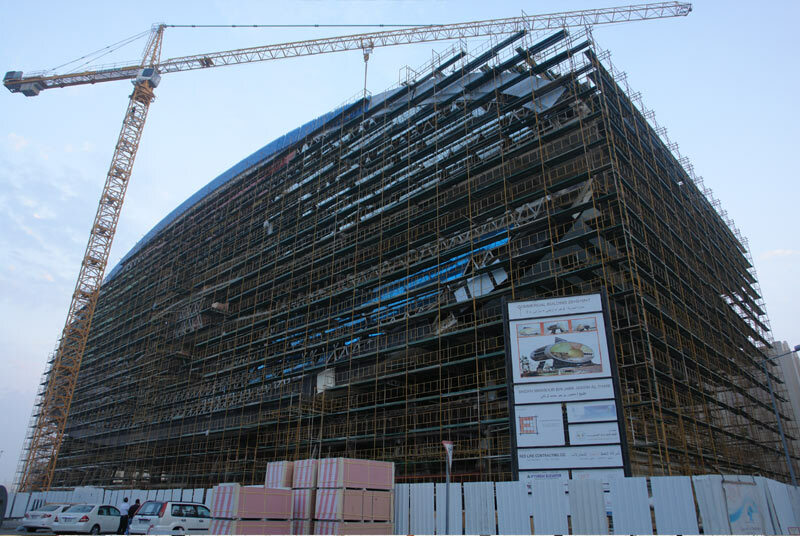 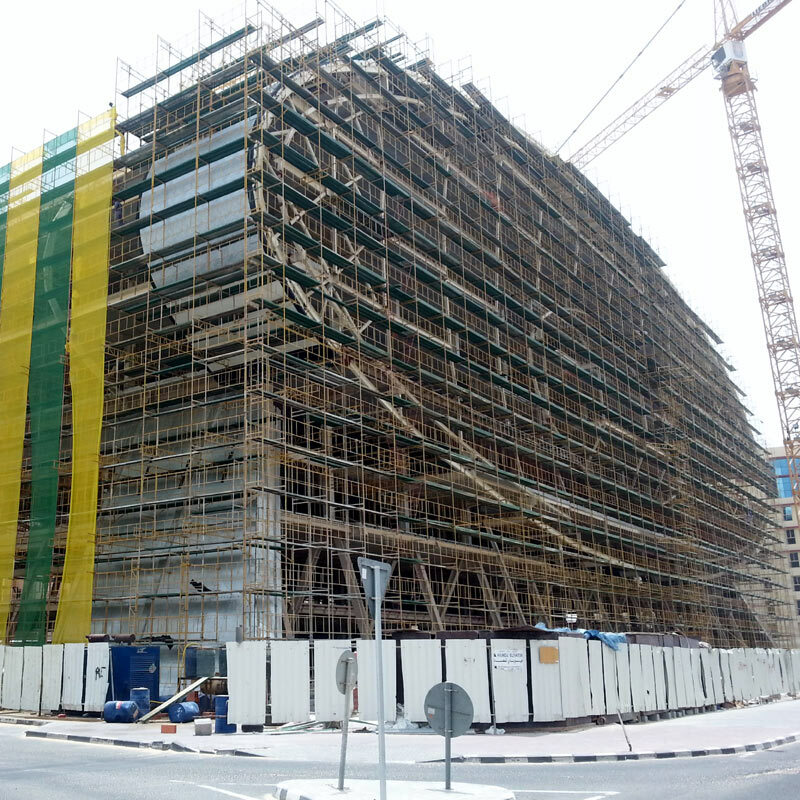 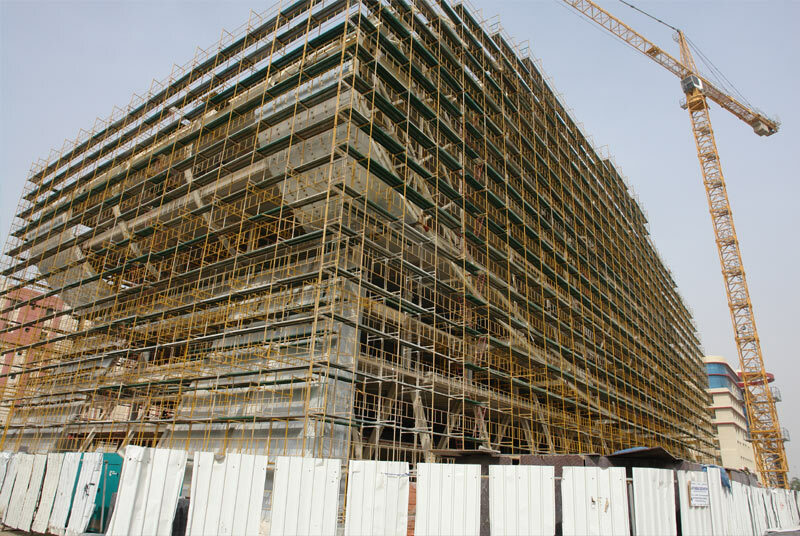 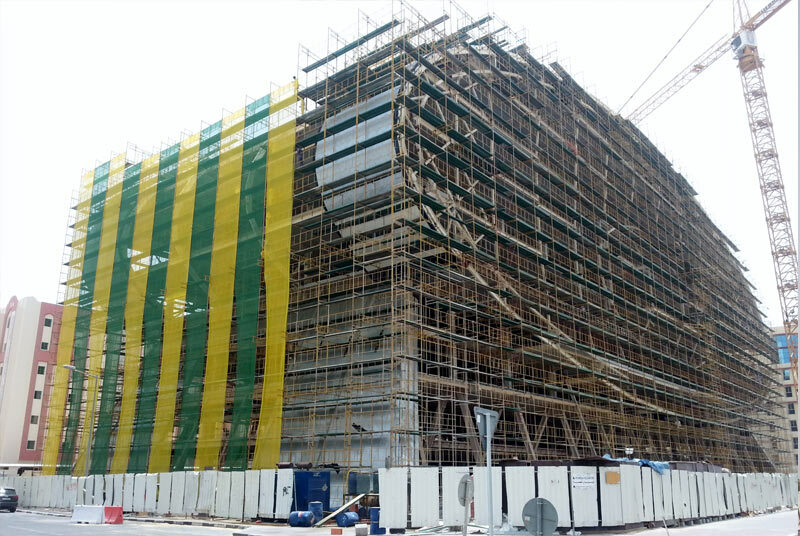 Our company, through its collaboration with the Qatar’s Sheikh Mansour Bin Jabr Jassim Al-Thani and the companies Red Line and QST (Qatar Steel Technologies) respectively took over the installation of metal scaffoldings to the Commercial Building. 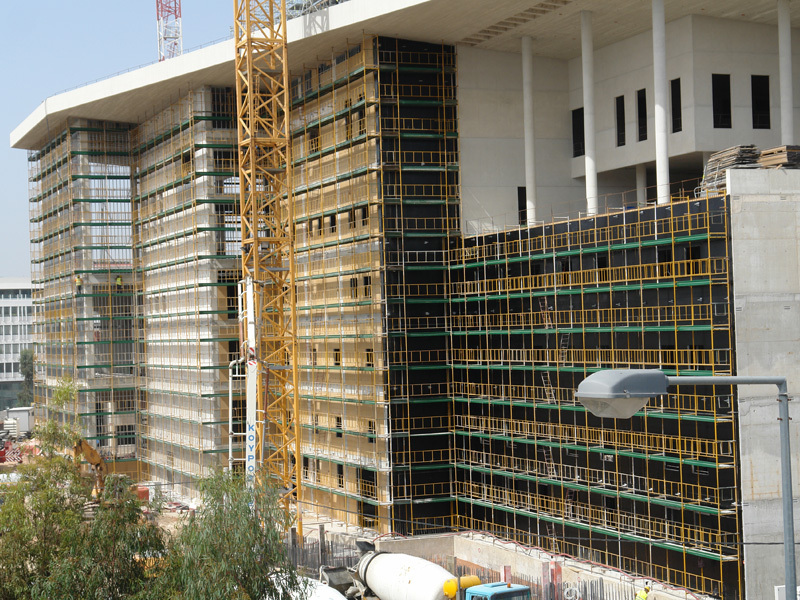 The building’s most important feature is its shape as it looks like an eye. 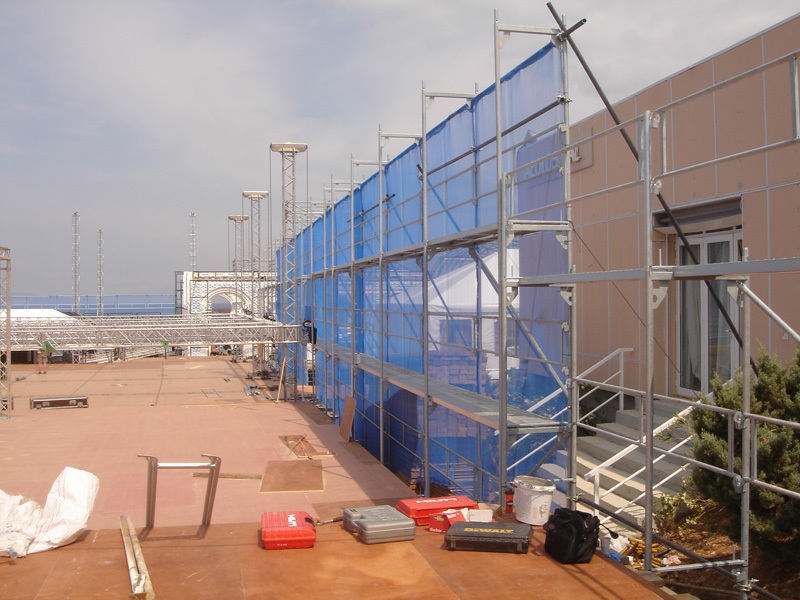 Metal scaffoldings were places around the perimeter of the building whose sides are not vertical. 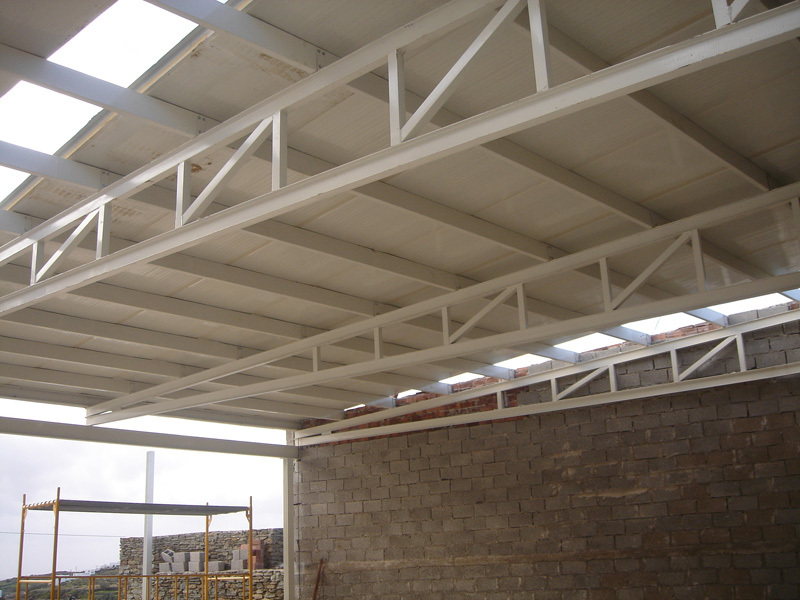 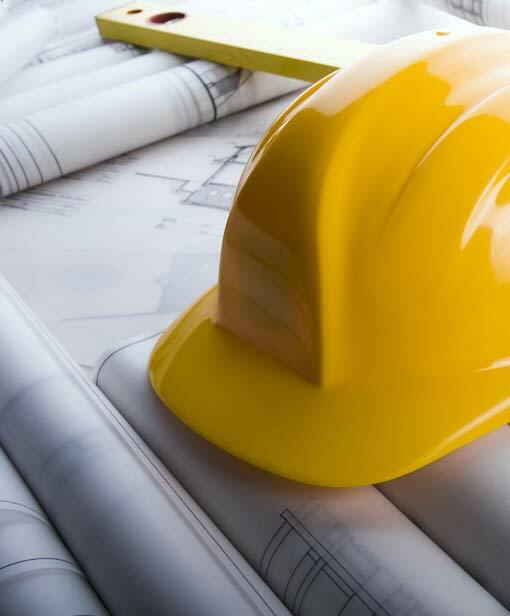 The site-leaders of our company proved their experience and the company’s elements were adequate enough as no delays were mentioned throughout the whole construction phase. 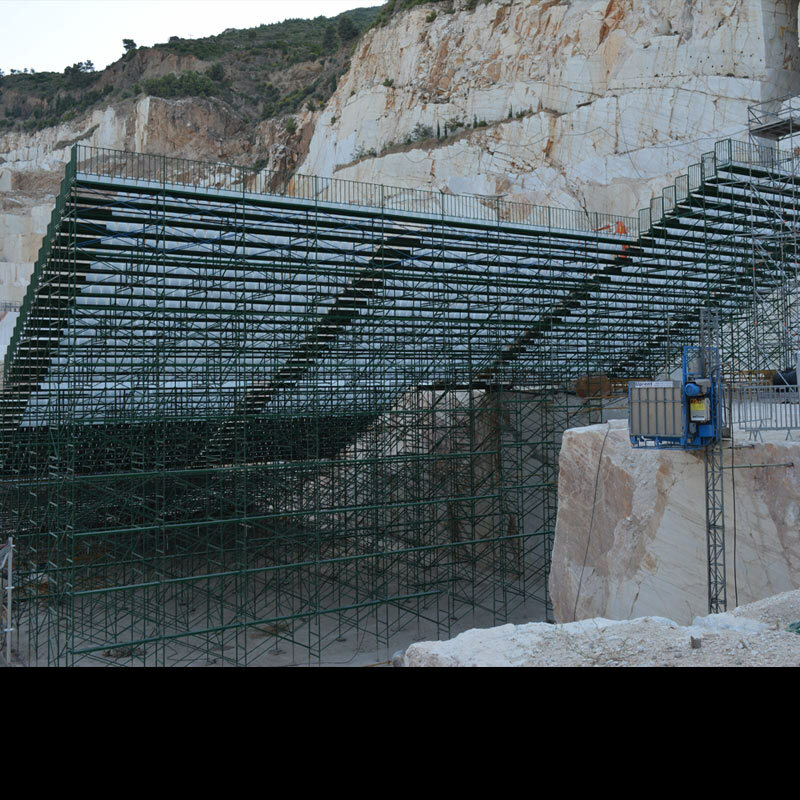 PROJECT: Settling, hiring and disassembling of a stage for the Wedding Reception that took place in Asteras-Vouliagmeni. 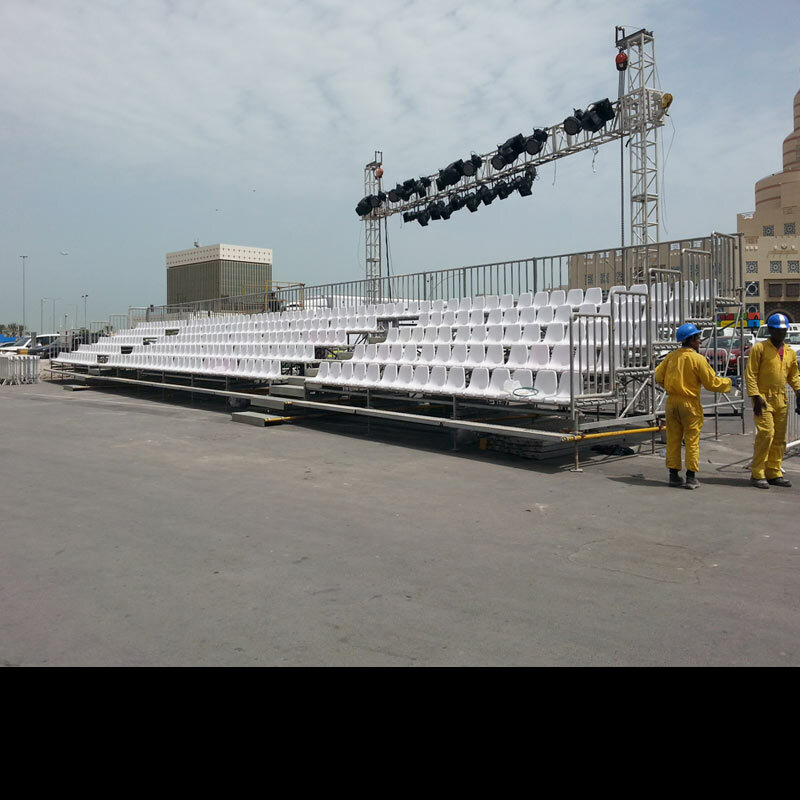 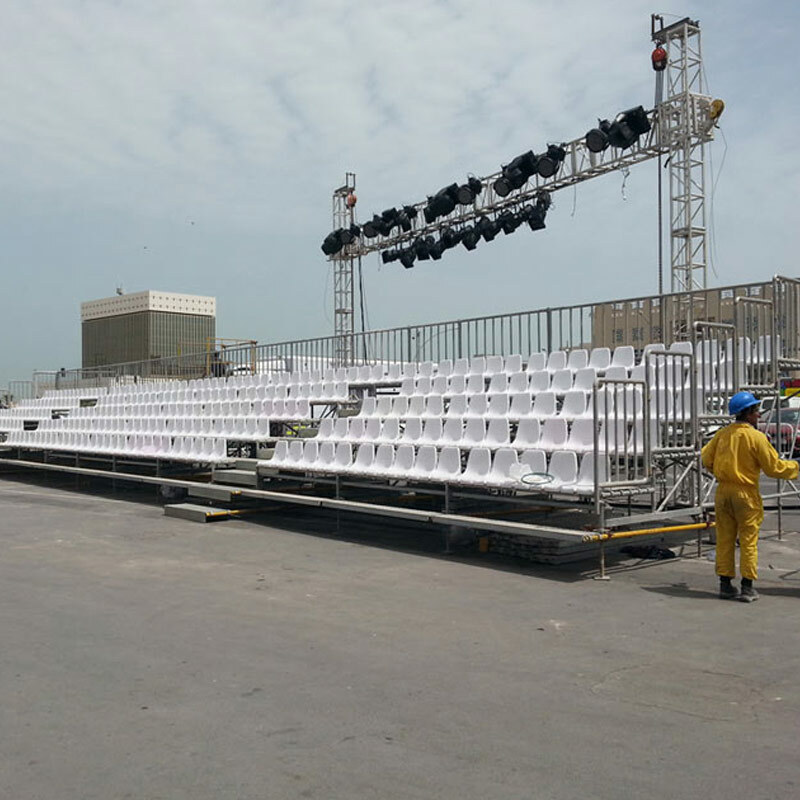 Our company was called to create a stage that could host over 950 people, who were the Wedding’s guests. 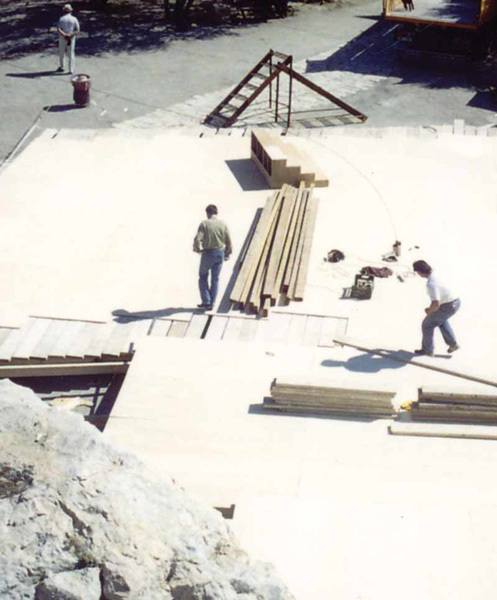 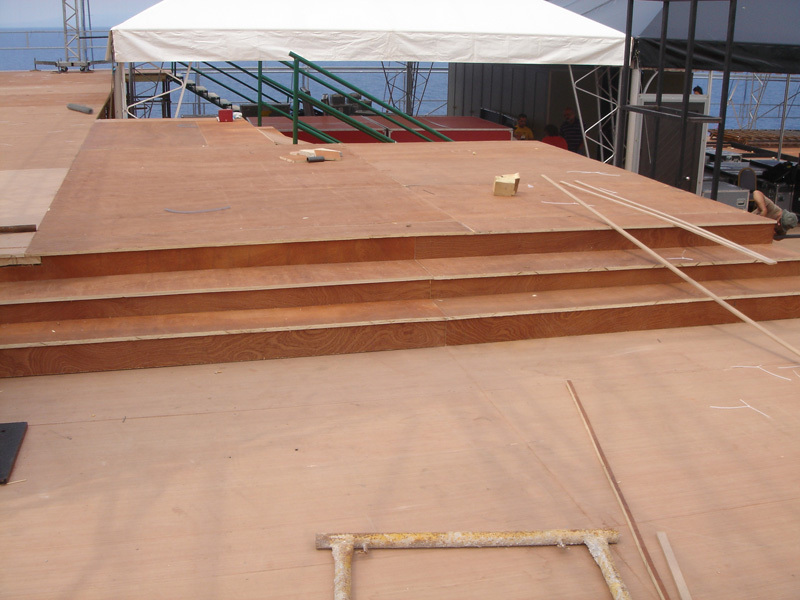 The stage’s final surface was plywood in different levels. 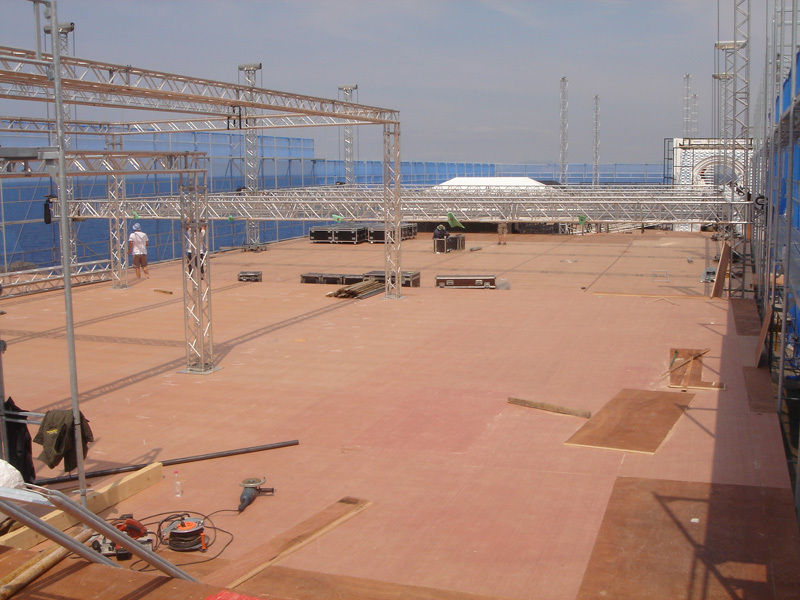 The total surface was over 2800m2, while the height differences of the ground was no problem for our crew. 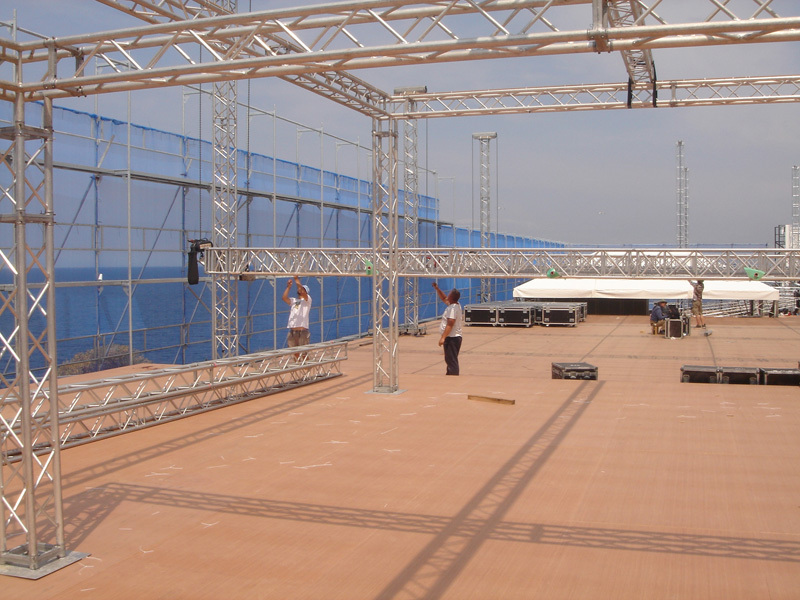 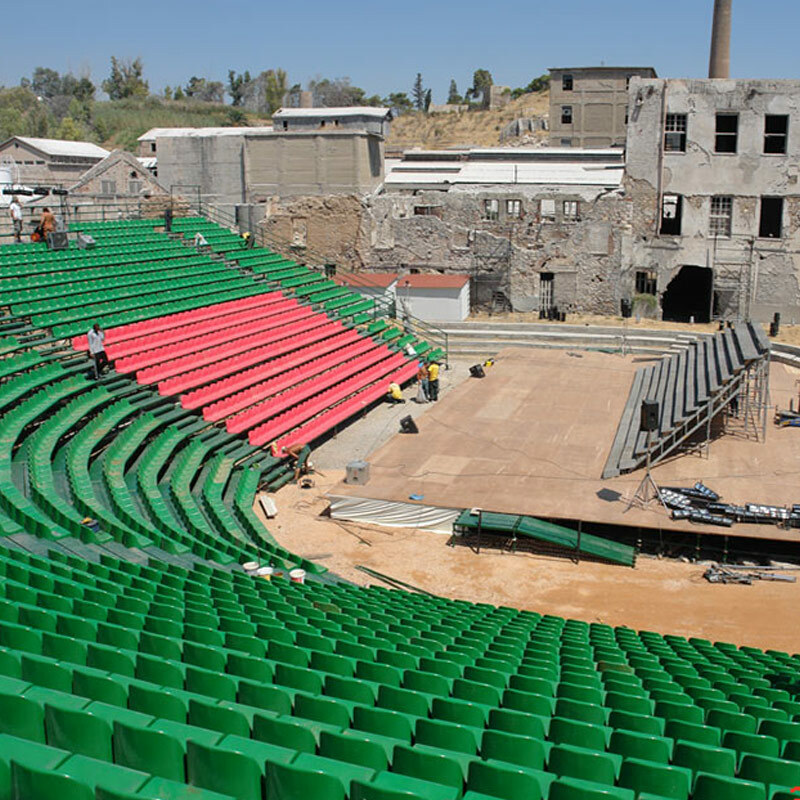 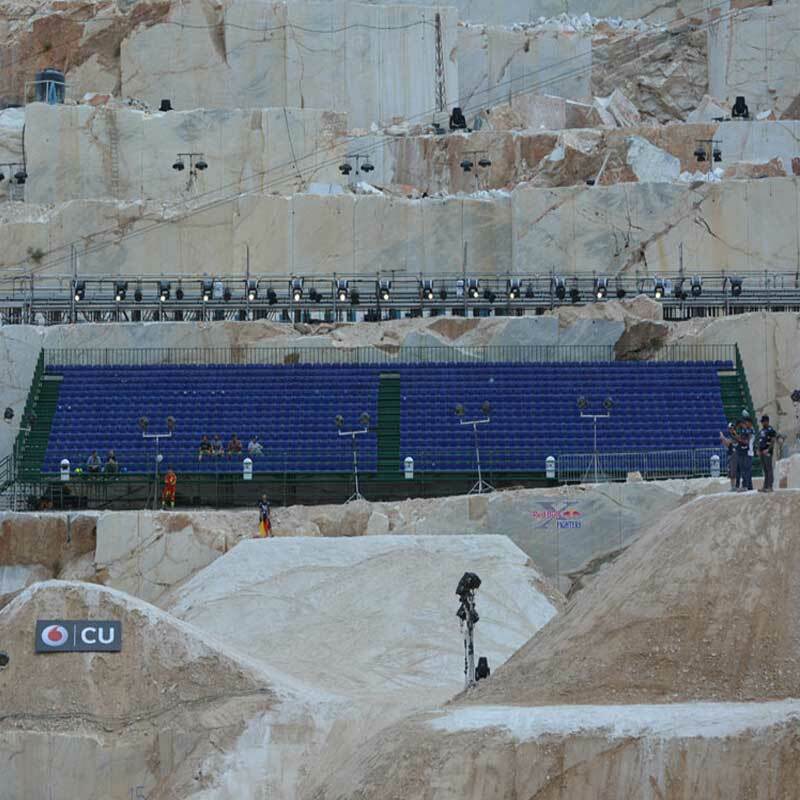 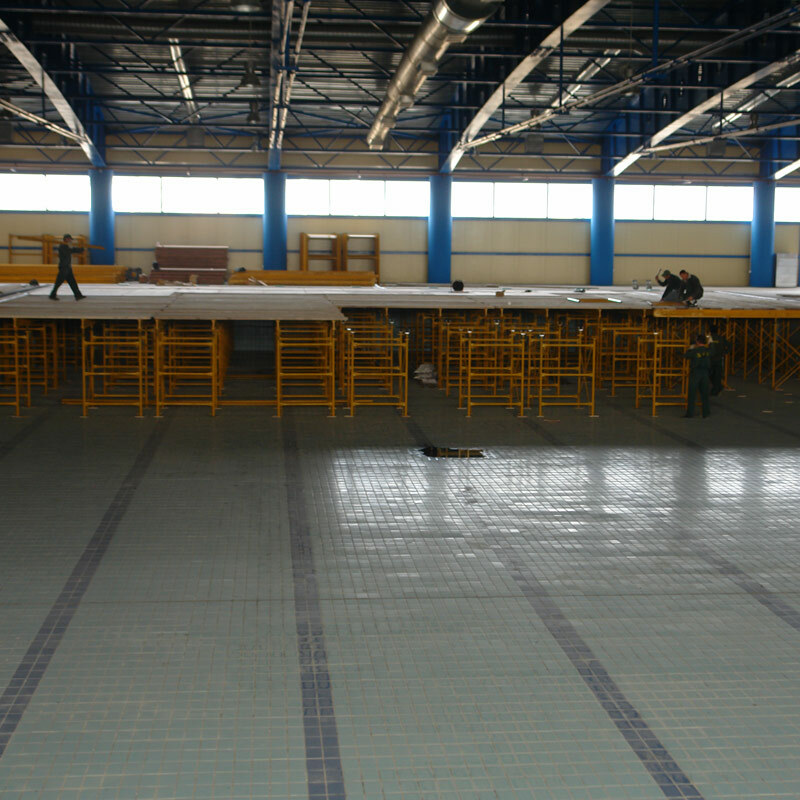 PROJECT: Settling, hiring and disassembling of a stage for the European Fencing Championship at Florina in 2008. 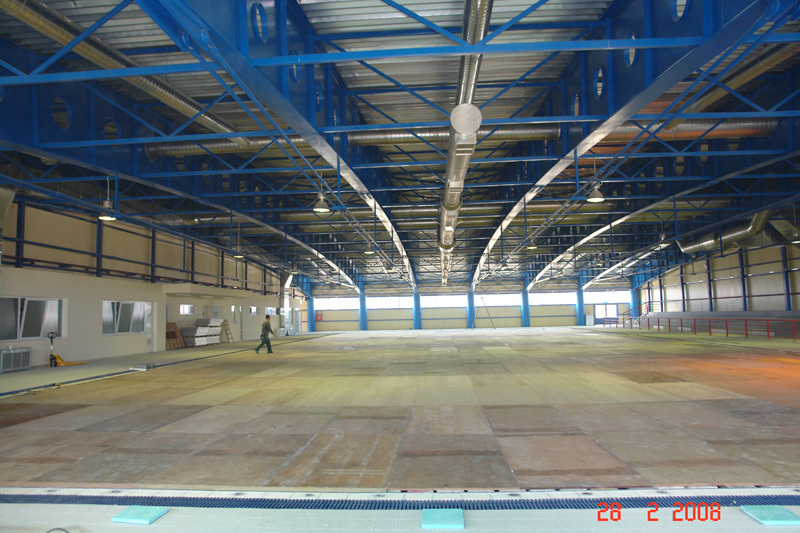 The Championship was held in the Swimming Pool establishment of Florina in 2008. 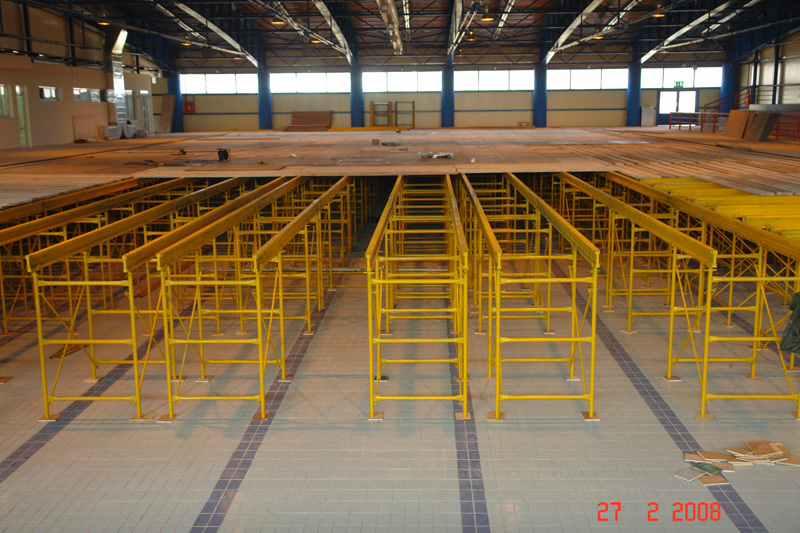 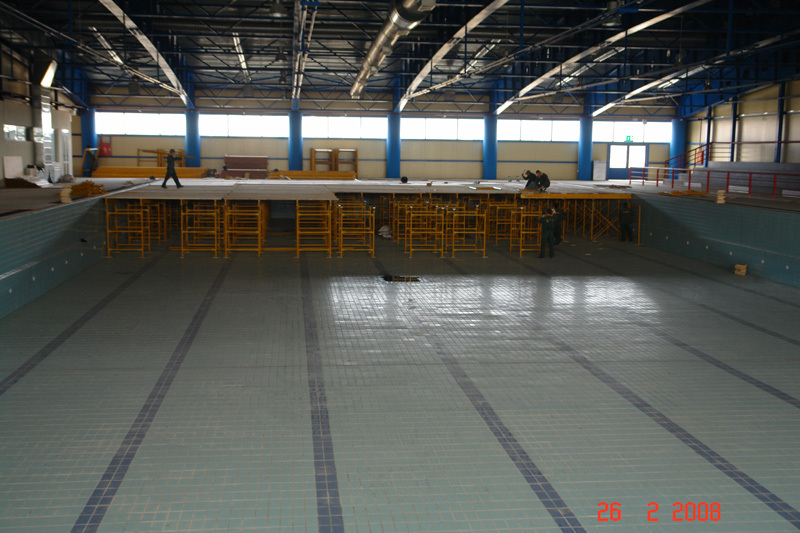 Our company covered the whole pool’s surface, of over 1000m2. 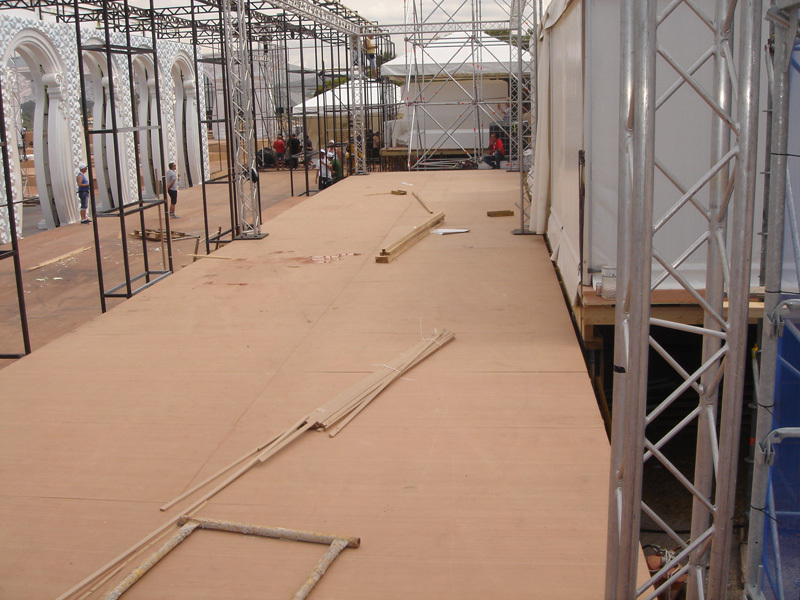 The stage was based on scaffoldings, while wooden pieces were utilized to prevent traumatizing the pool’s tiles. 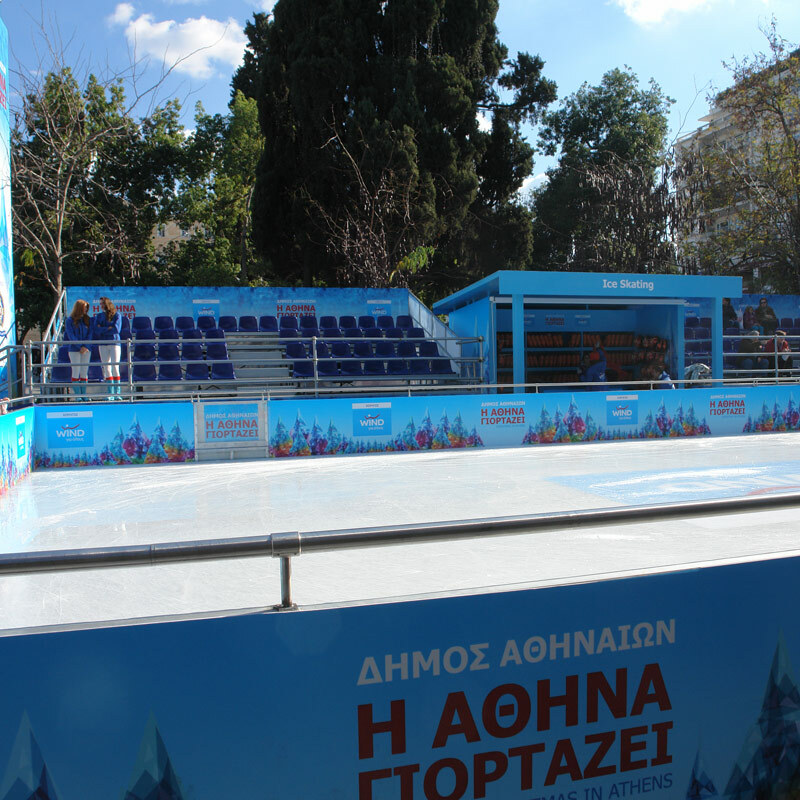 PROJECT: Settling, hiring and disassembling of a stage-ice rink with landings and metal tribune at Sintagma Square in 2012. 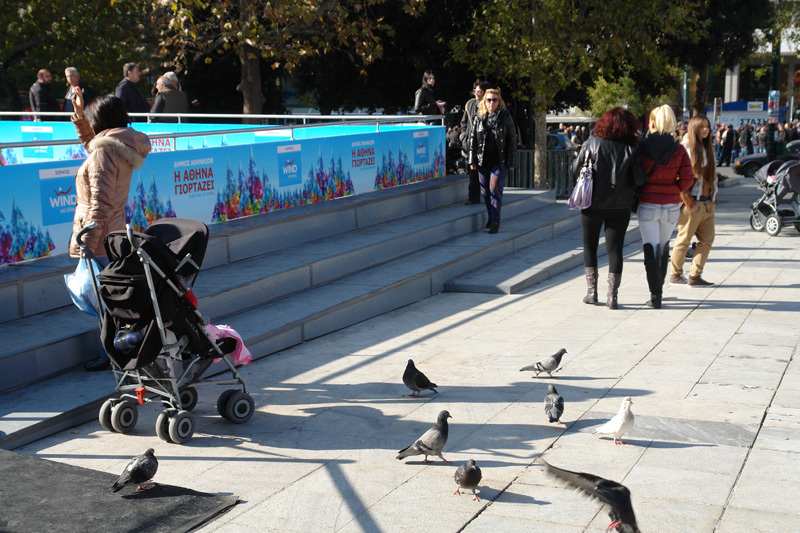 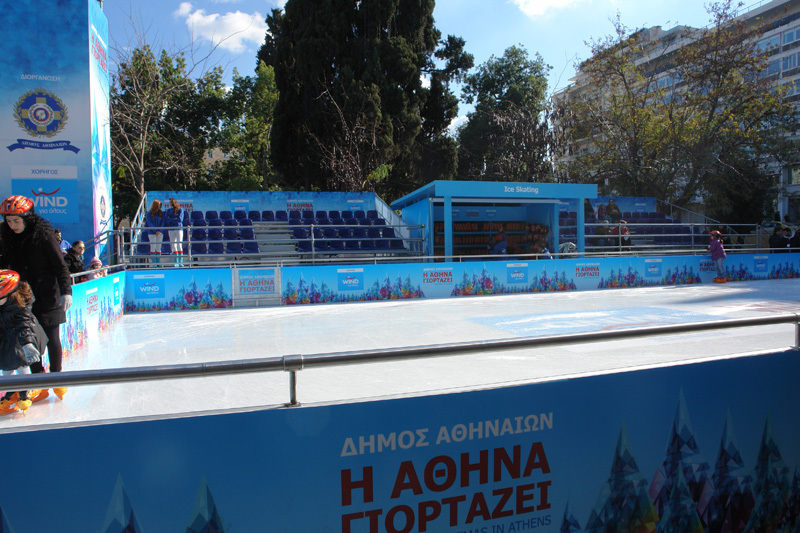 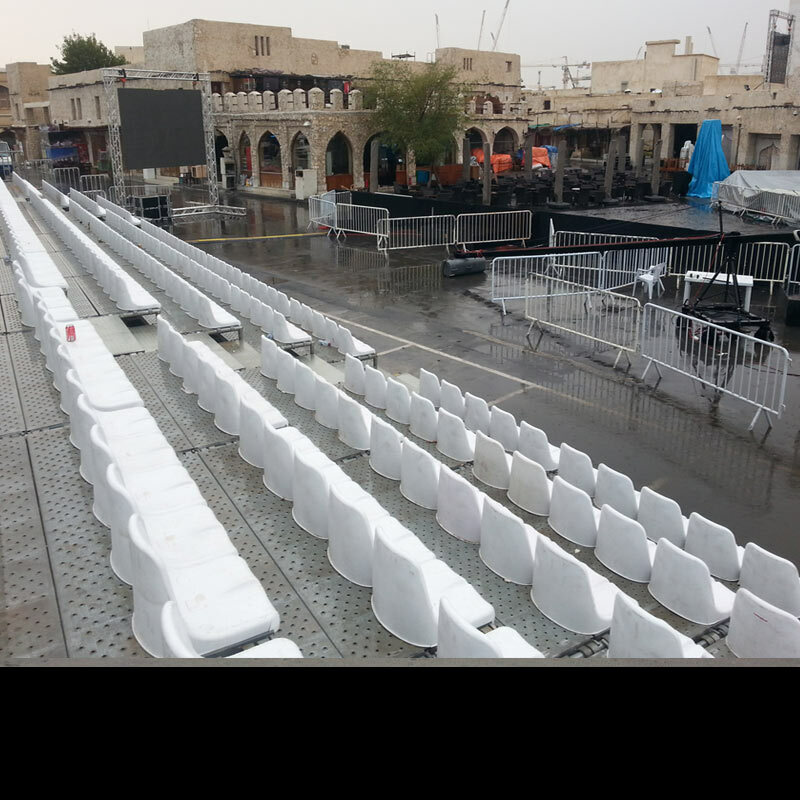 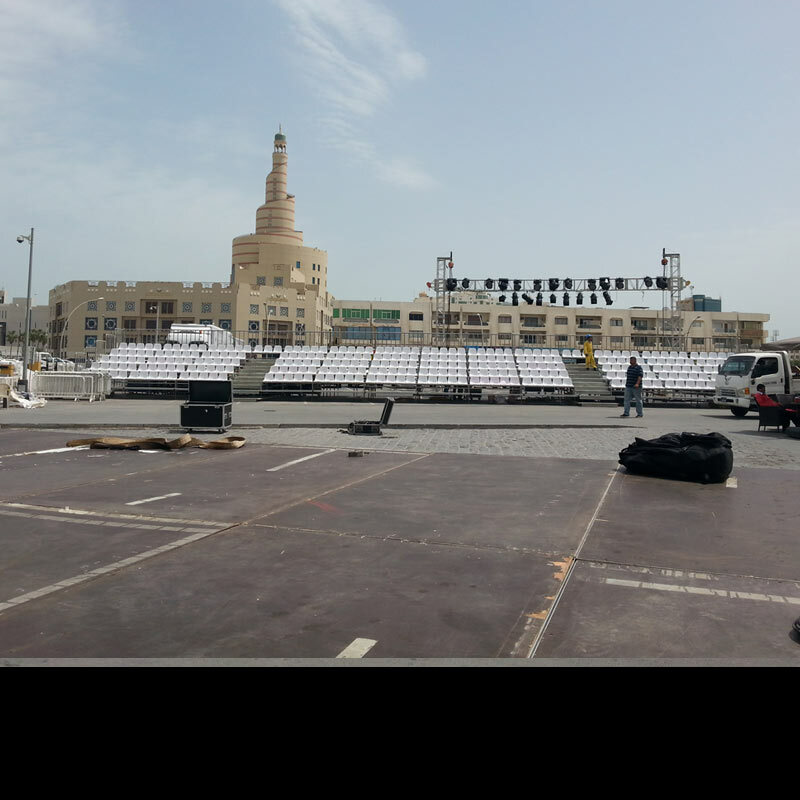 The stage-ice rink was placed at Sintagma Square, with the Square’s inclination to be no problem for our crew. 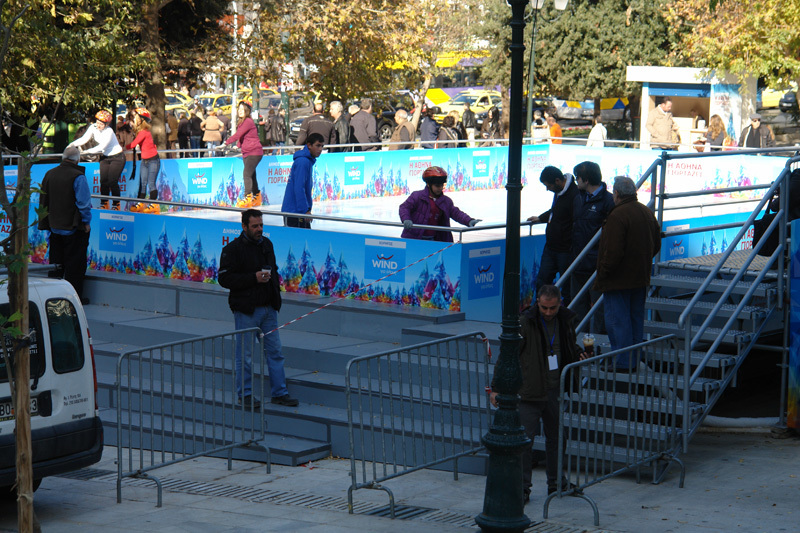 The landings were placed at the points of maximum height difference between the Square and the Ice rink. 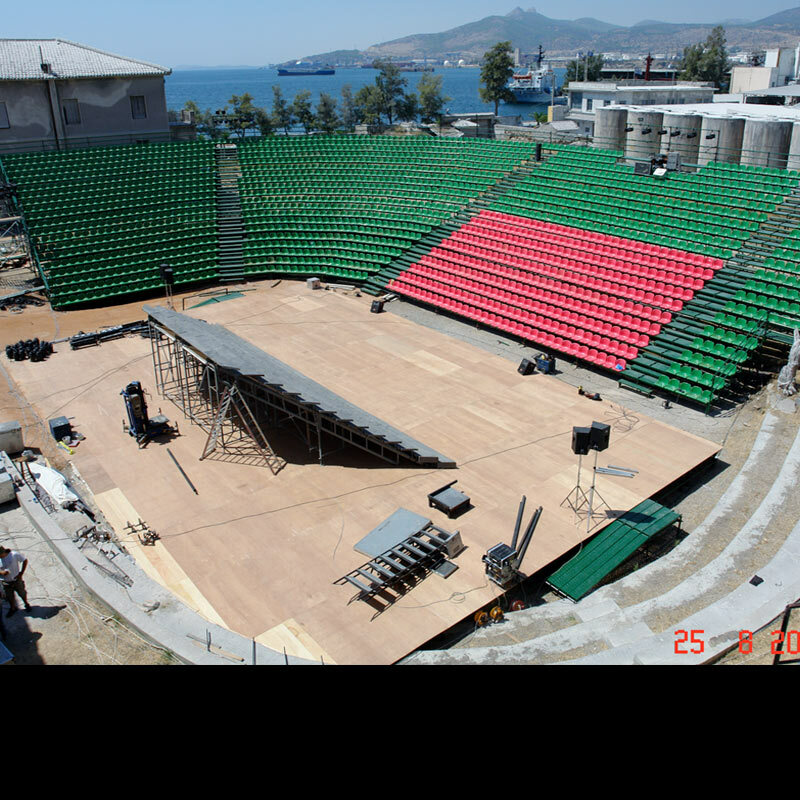 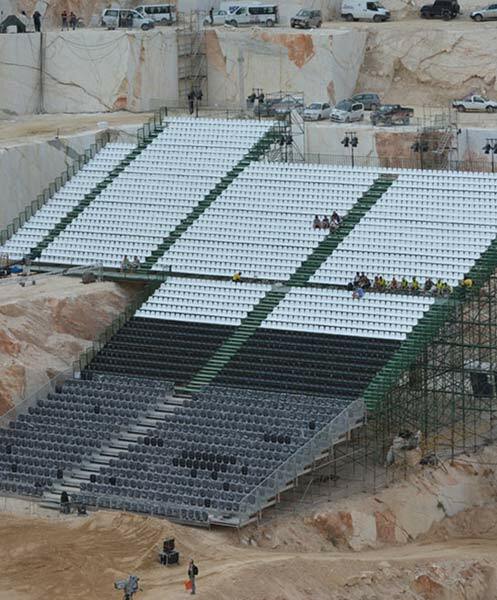 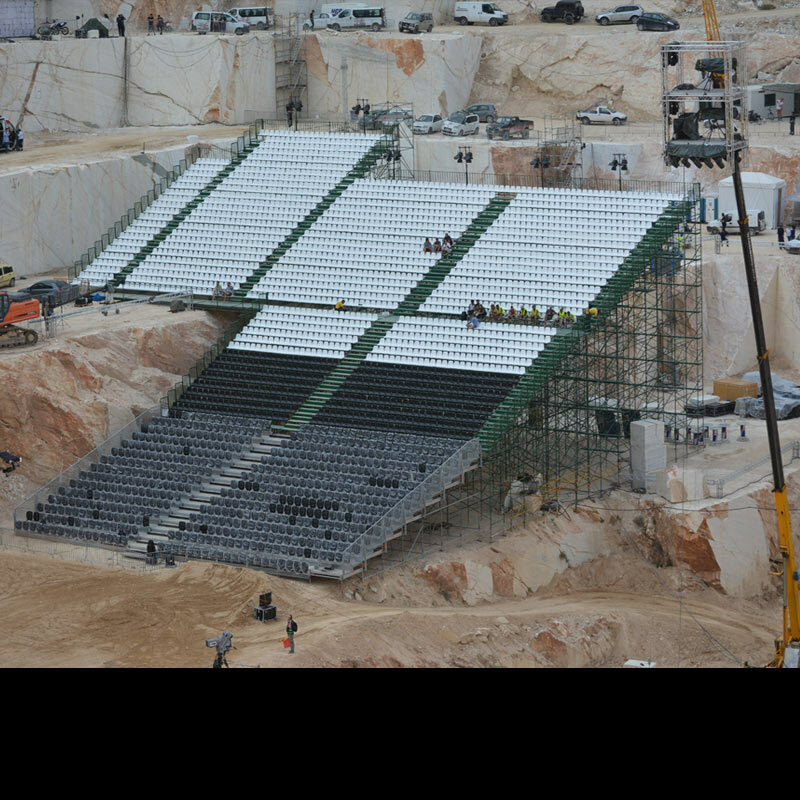 PROJECT: Placement of a stage at the box of the Horse Race Track at Markopoulo. 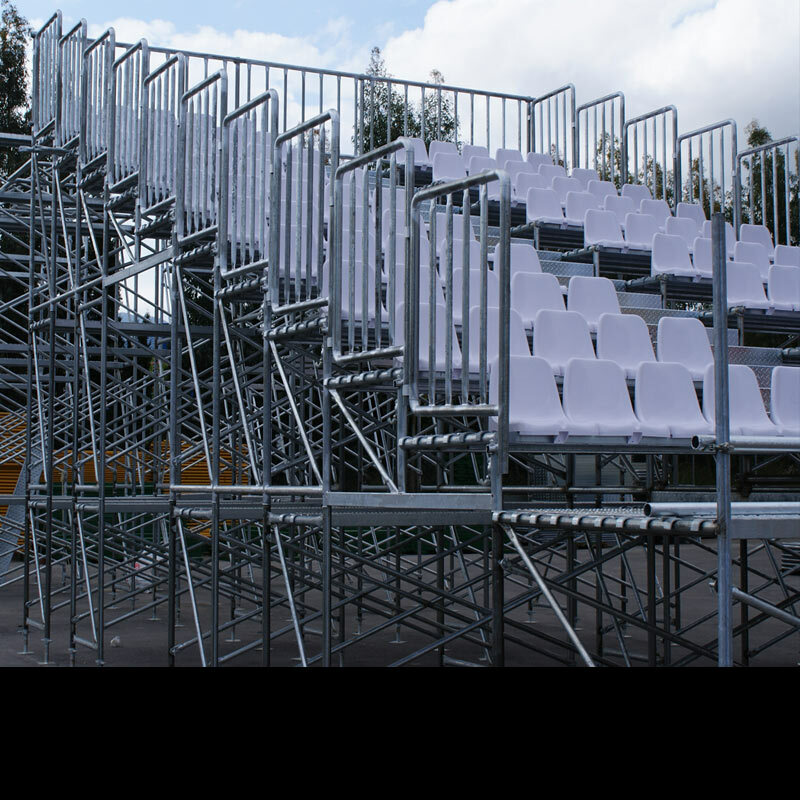 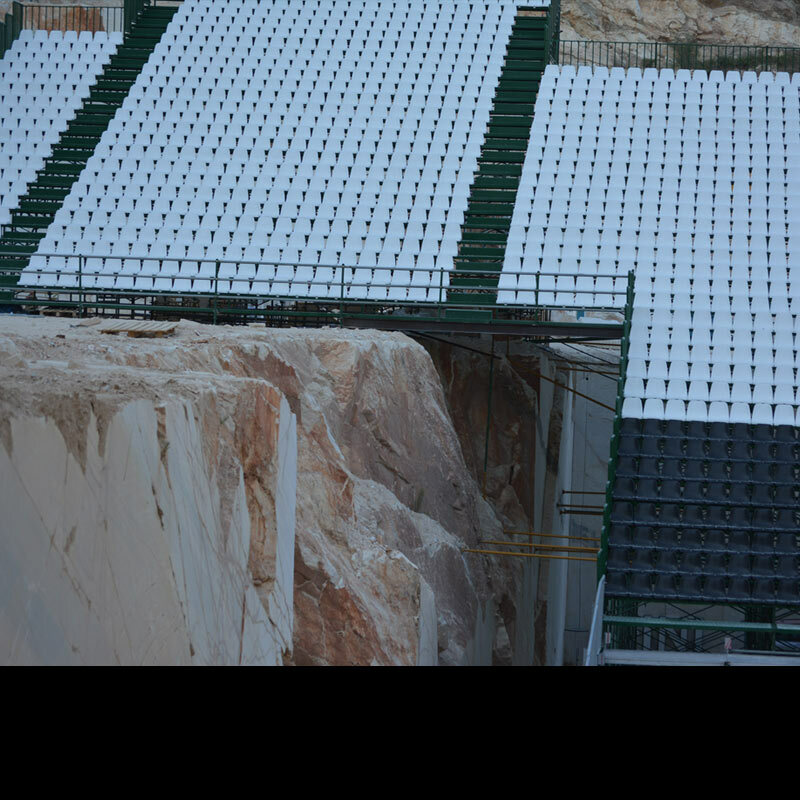 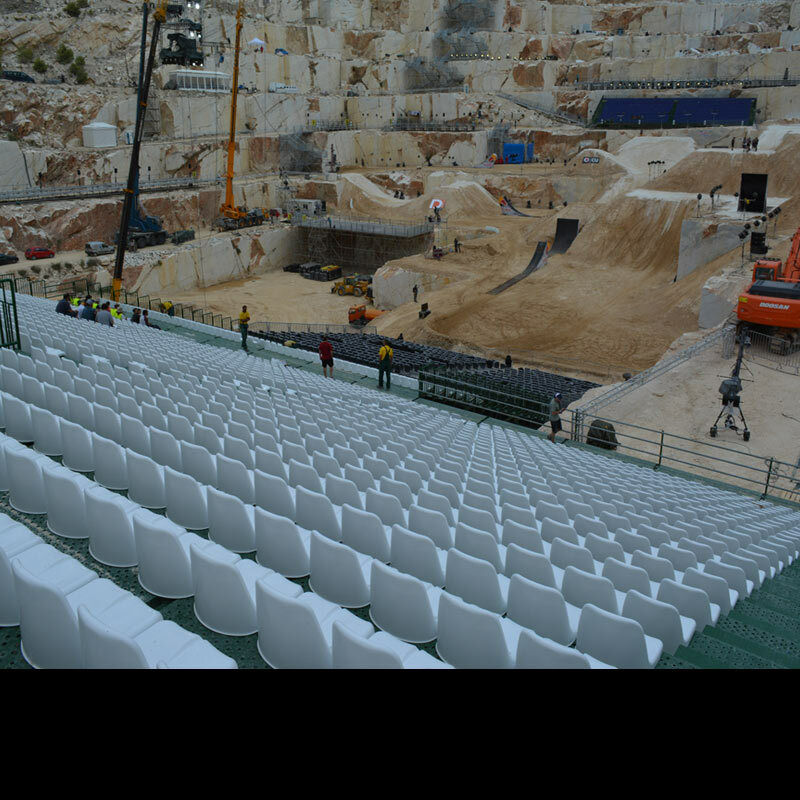 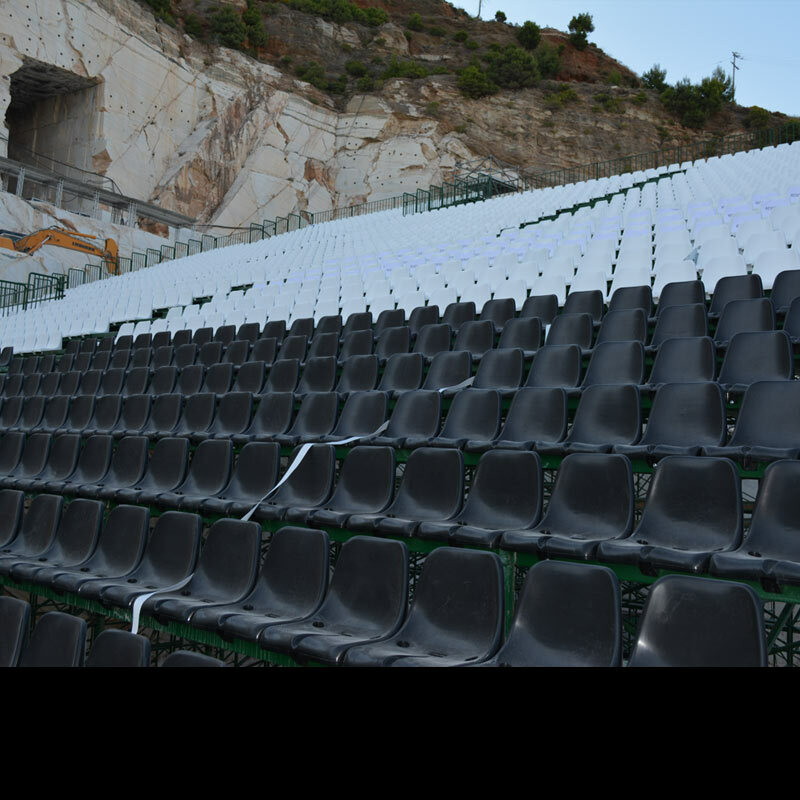 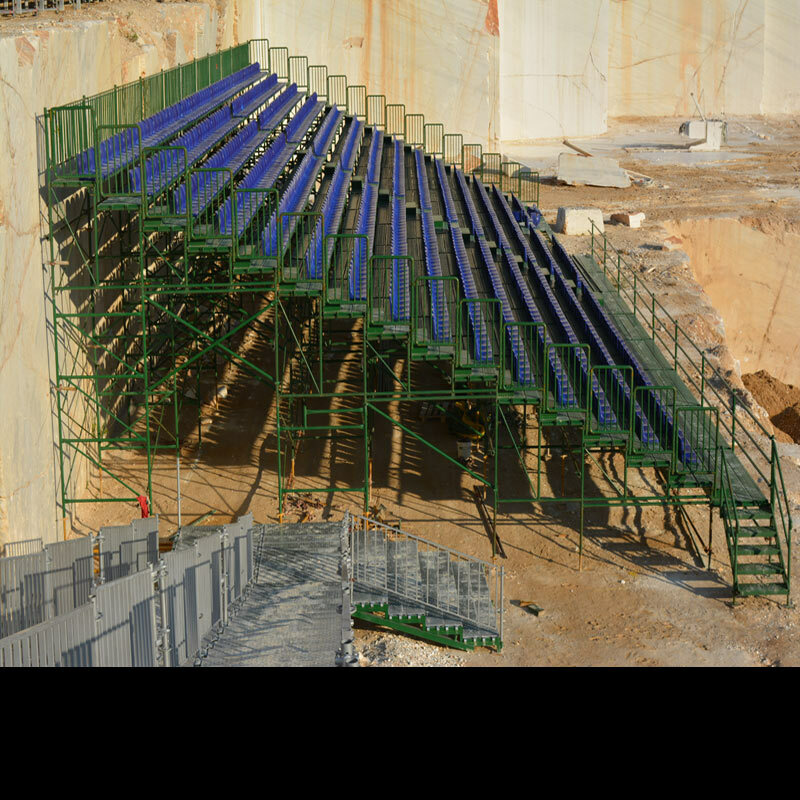 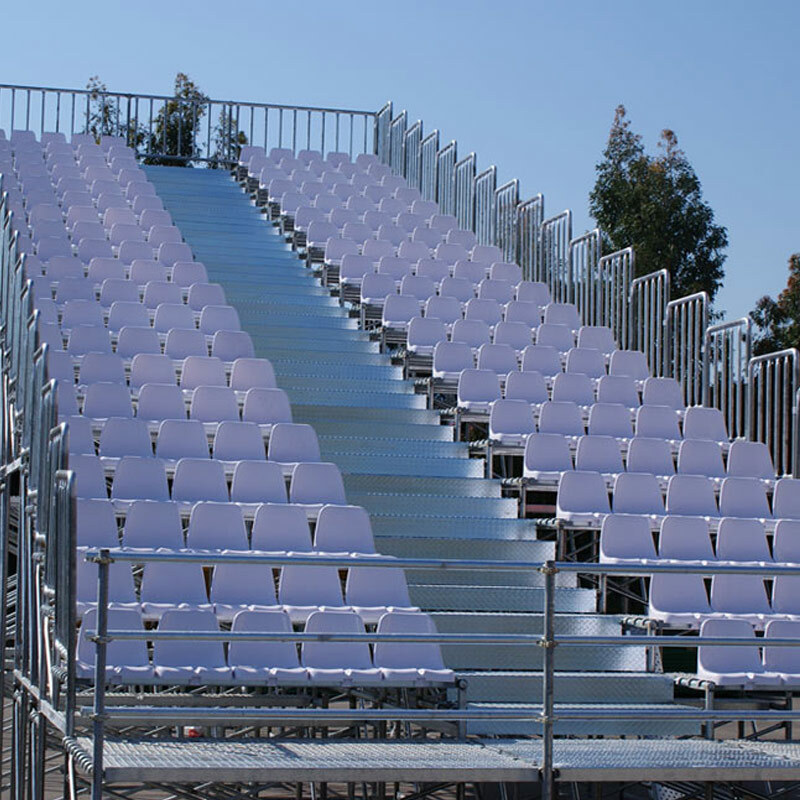 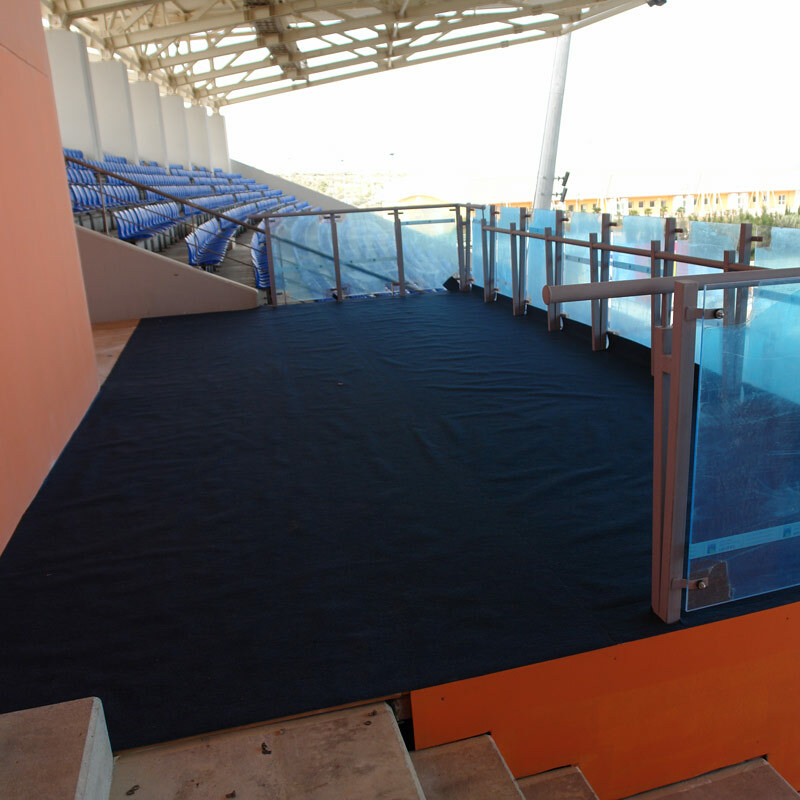 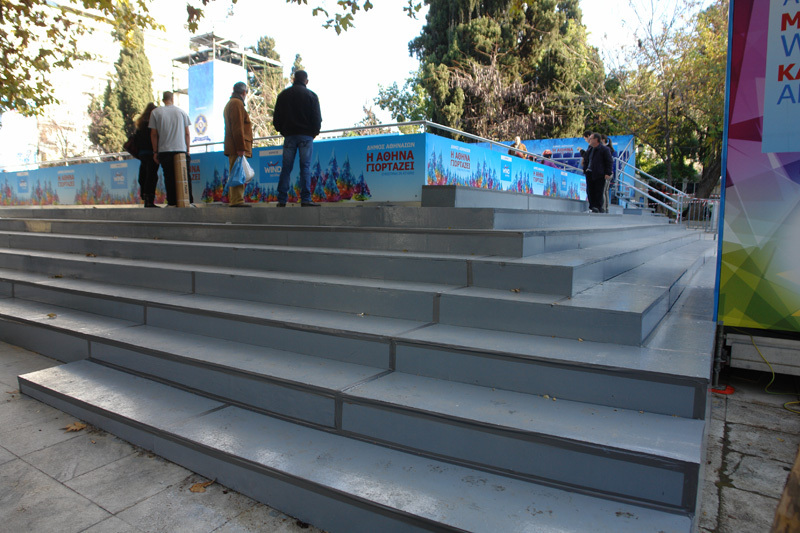 Our company was asked to place a stage of 20m2 of surface with protective bars at a point above the stairs of the box at the Horse Race Track in Markopoulo. 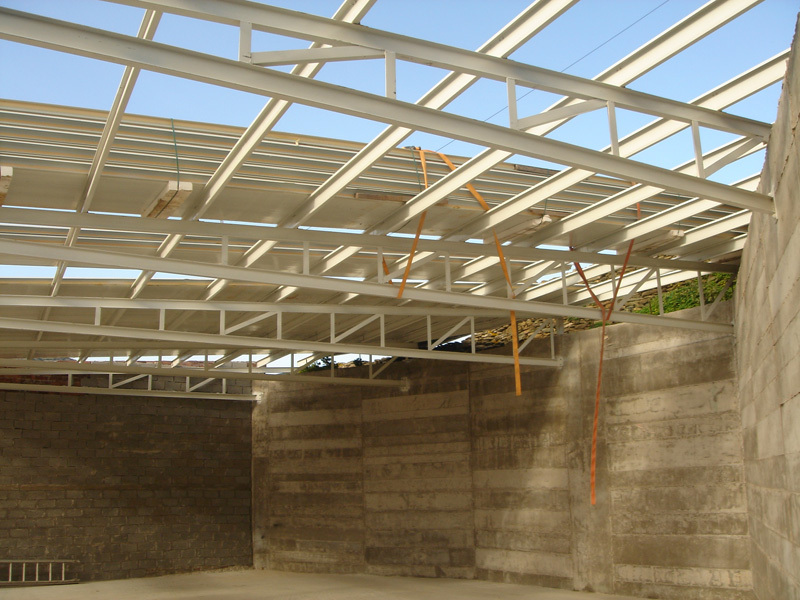 PROJECT: Metal roof in Sifnos Island. 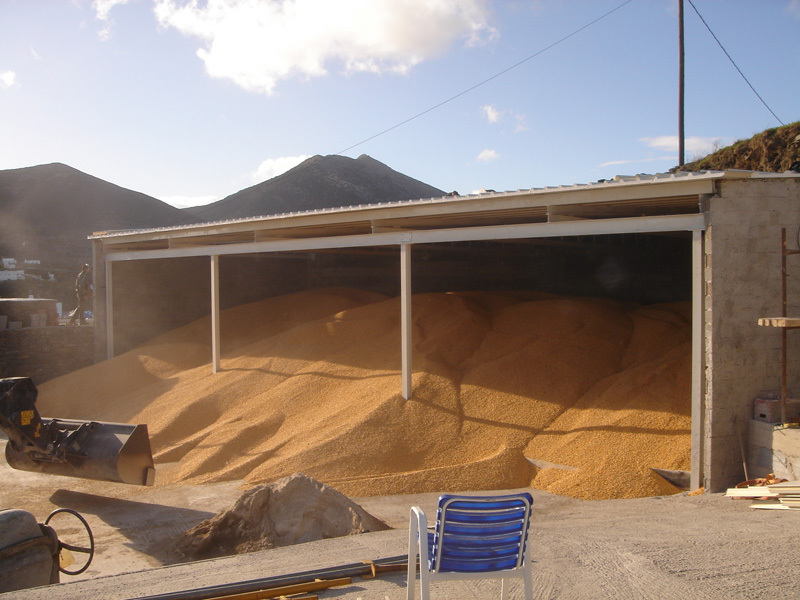 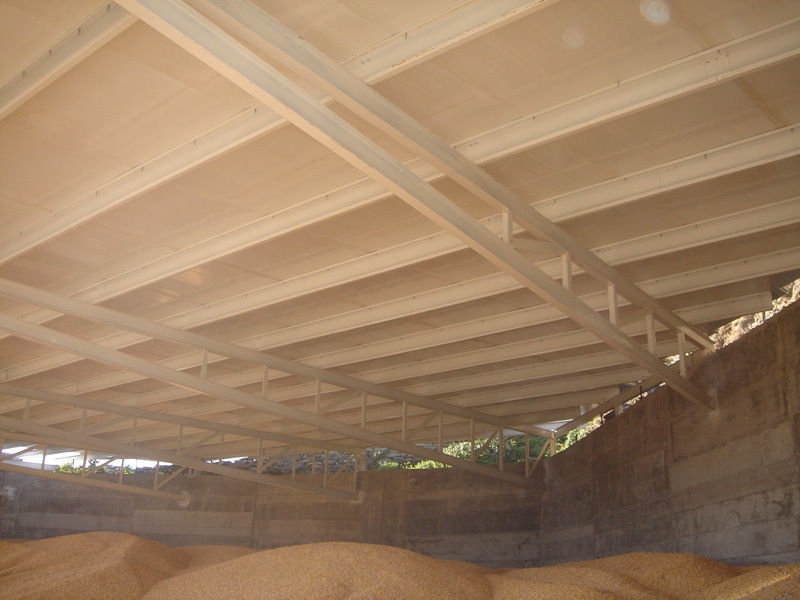 Placement of a metal roof for the formation of a wheat storehouse, using HEA beams and polyurethane panel of 5mm for the final surface. 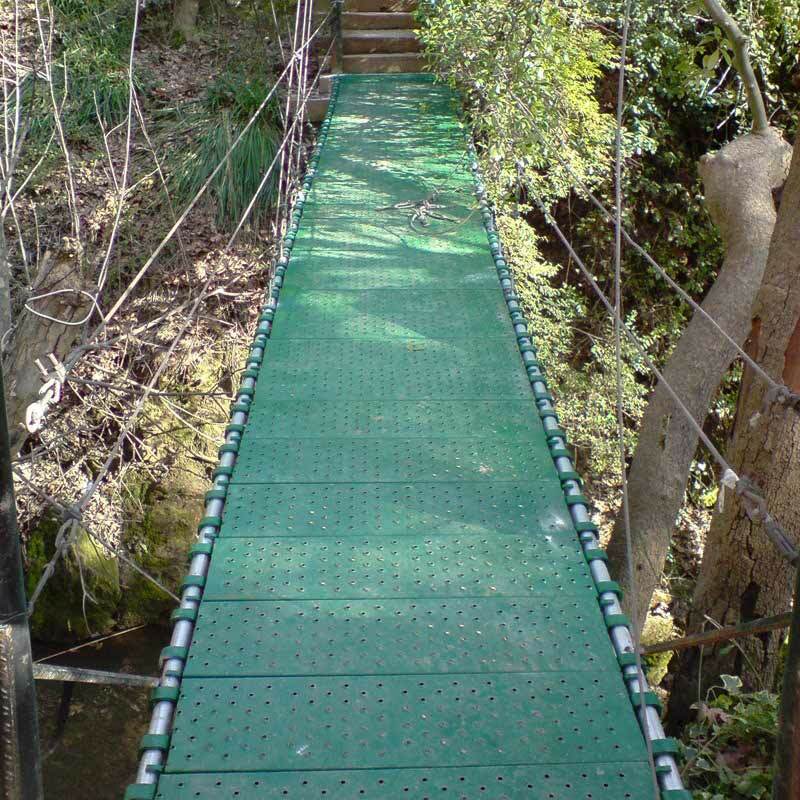 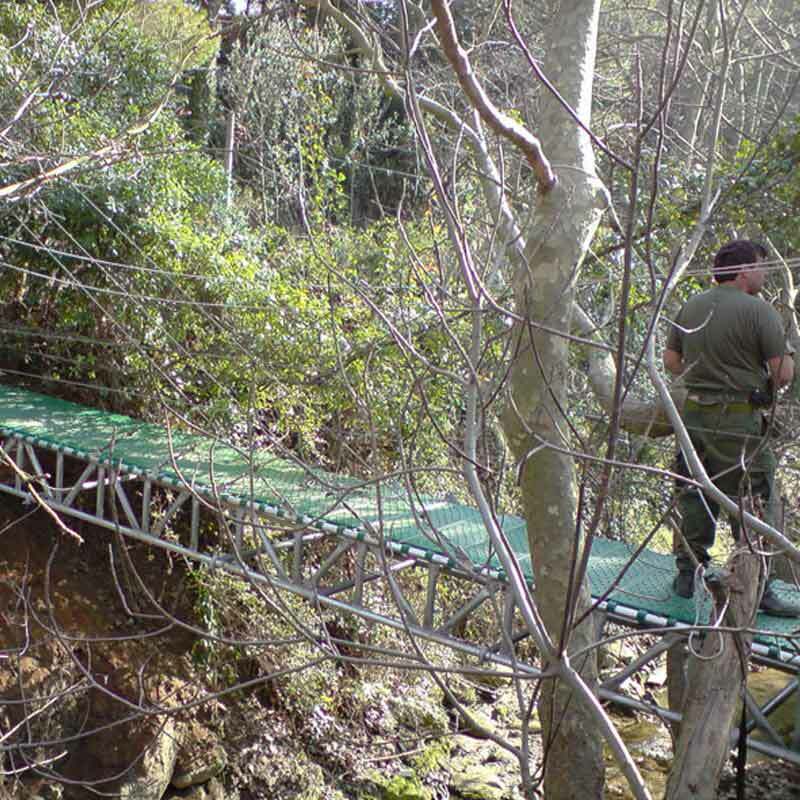 Placement of metal hanging bridge with metal antislip decks. 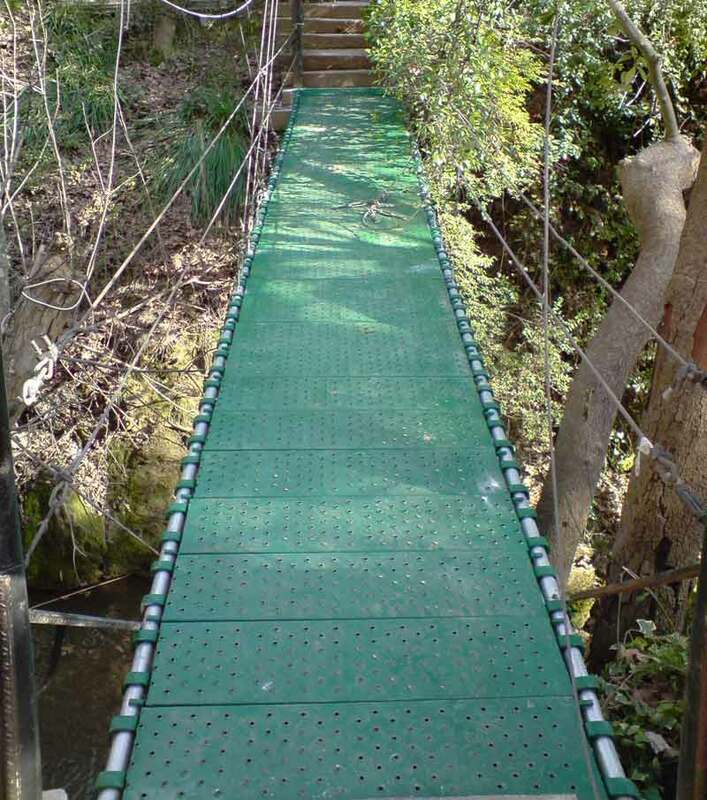 The bridge’s length is over 10,00m while its width is 1,20m respectively. 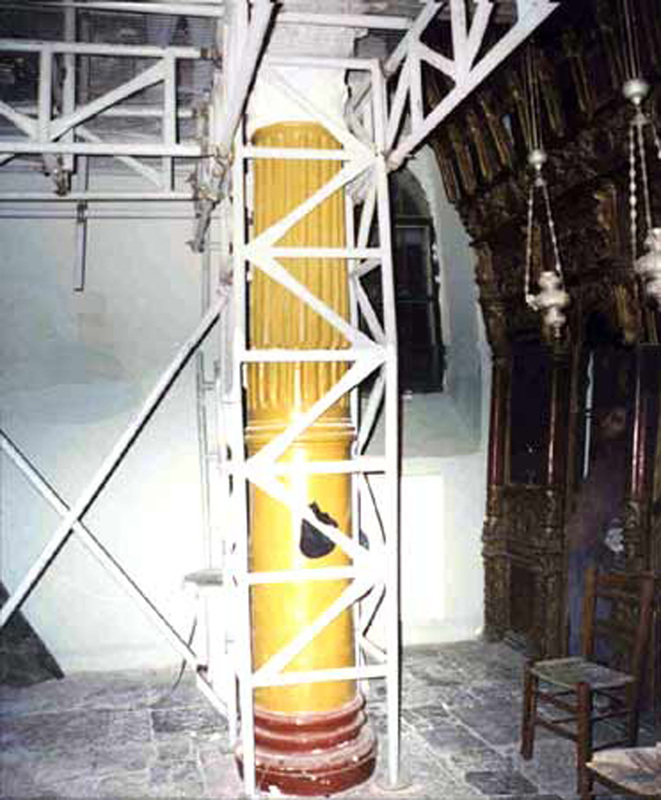 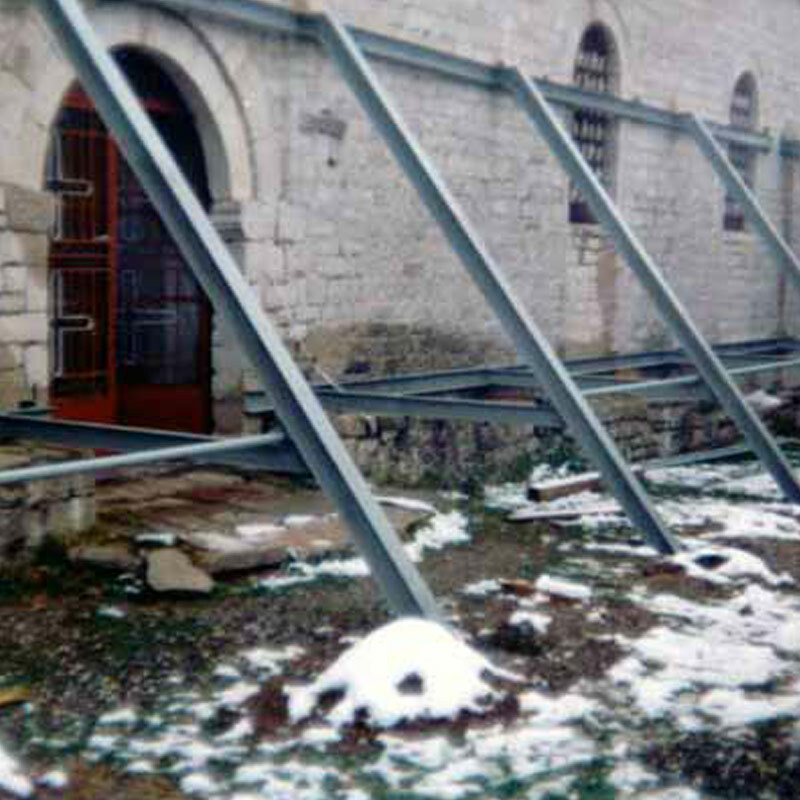 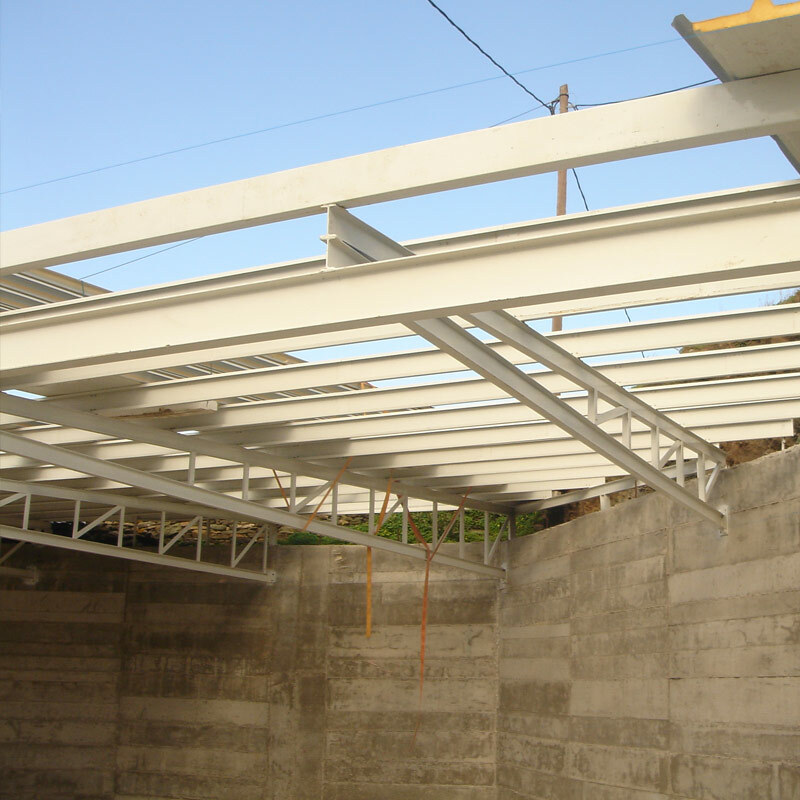 PROJECT: Metal support of the Panagia Varnakova Monastery in Nafpaktos. 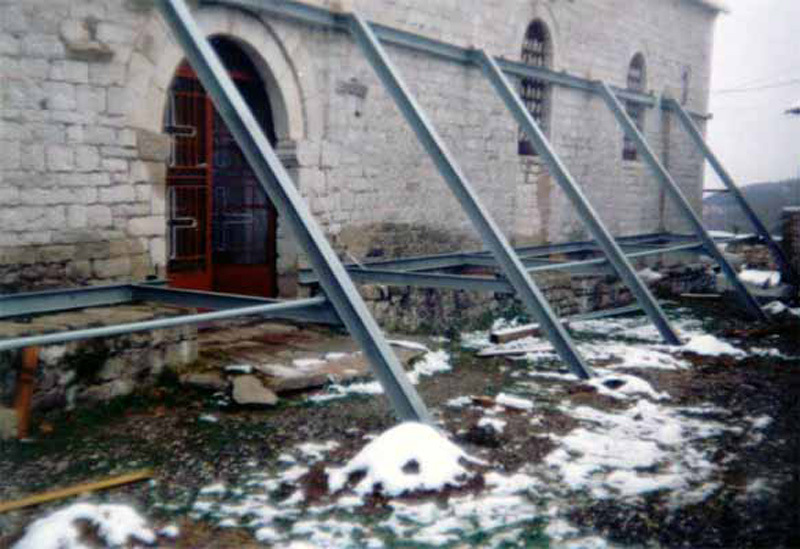 Placement of metallic construction both for the inside and outside of the Monastery in Nafpaktos. 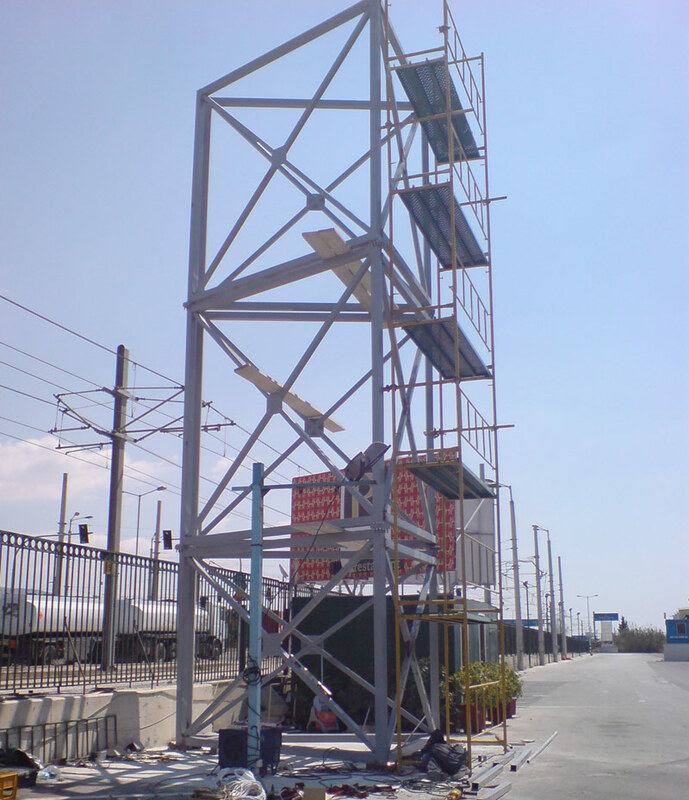 Placement of metal construction for hanging an advertising label at Poseidonos Avenue across the old Airport at Elliniko. 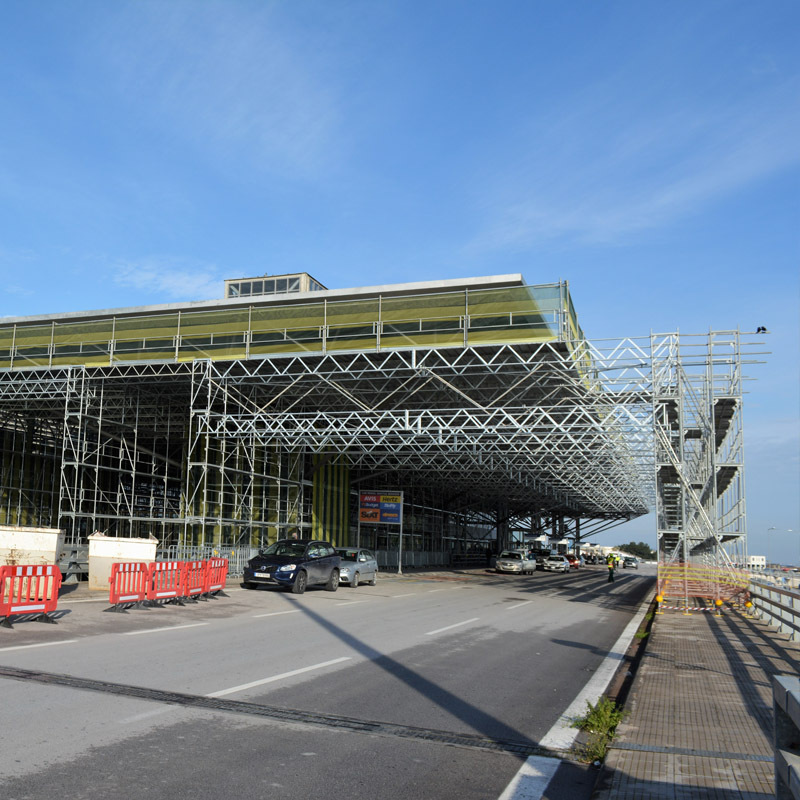 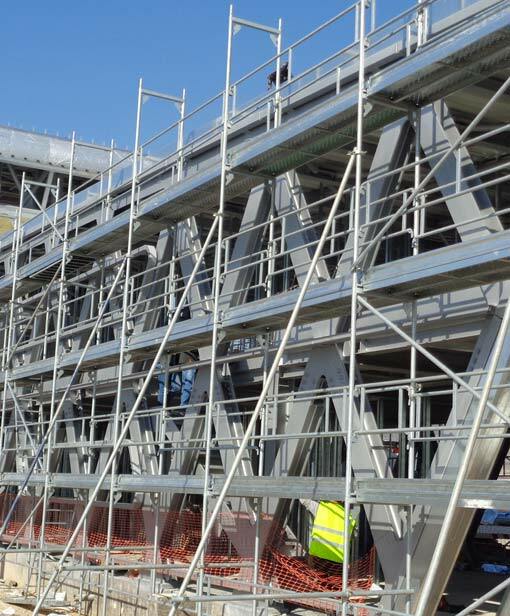 Our company was in charge for the erection of HDG metal scaffoldings and working decks for the maintenance of the canopies at the “Macedonia” International Airport in Thessaloniki. 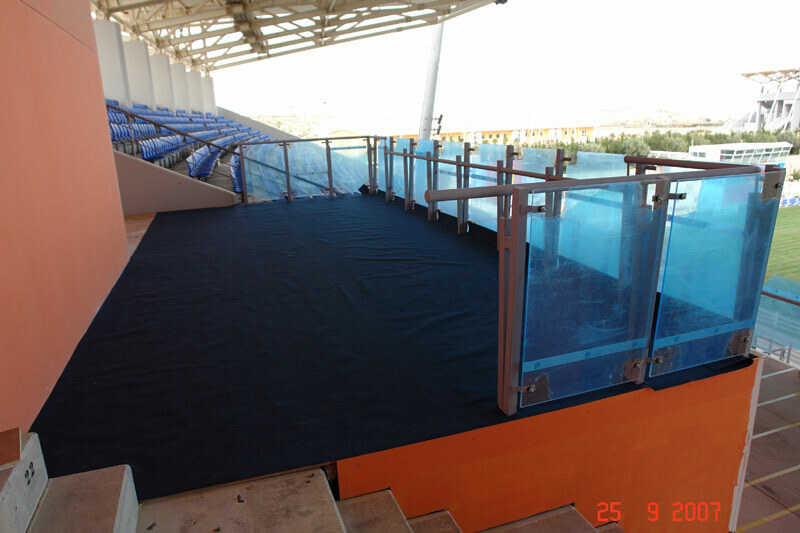 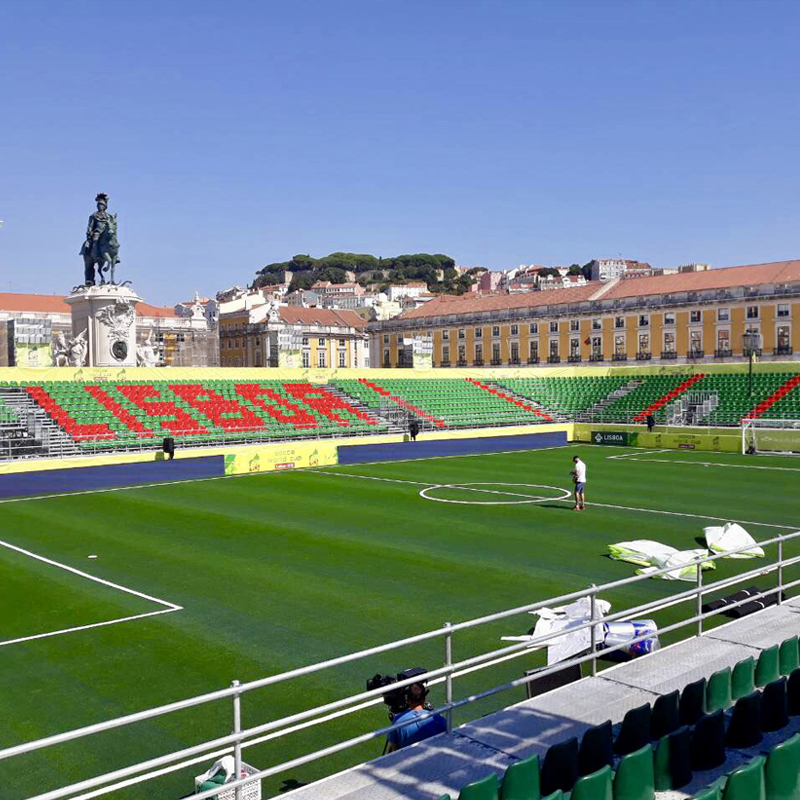 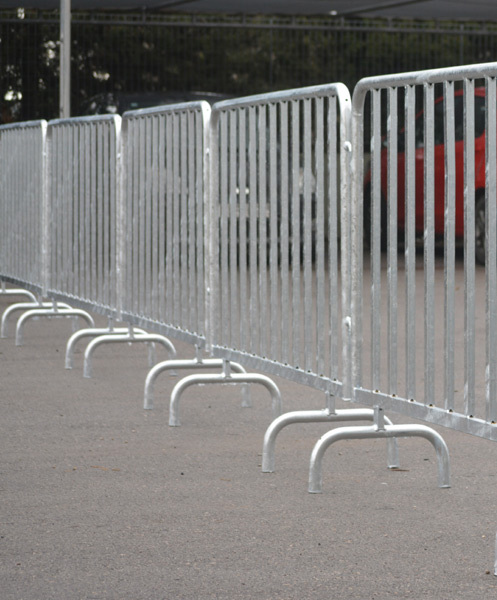 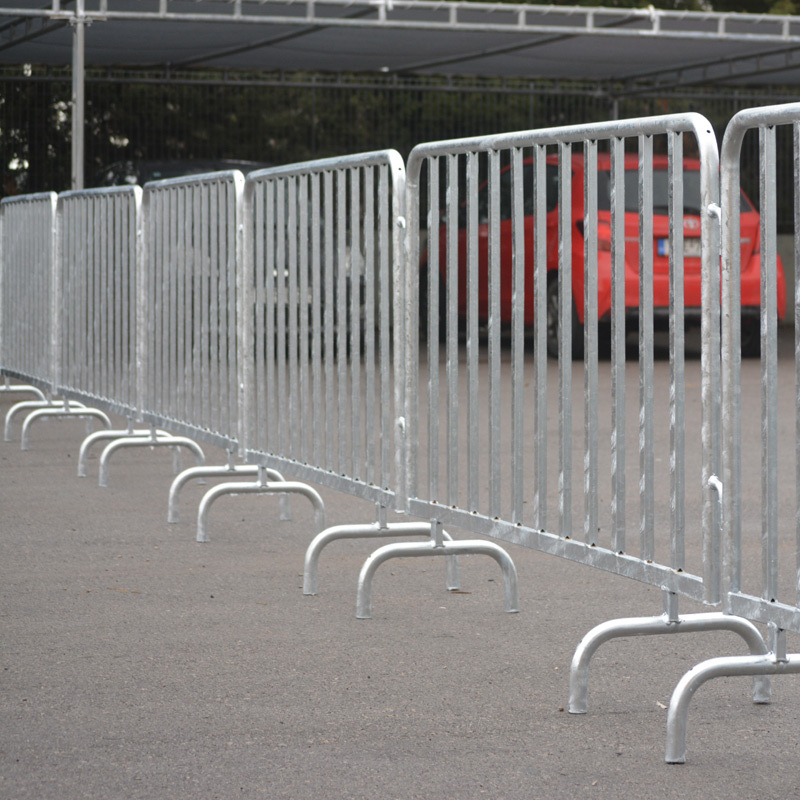 C. HOUNTOUMADIS S.A. has moved on with the production of newly designed fencing barriers. 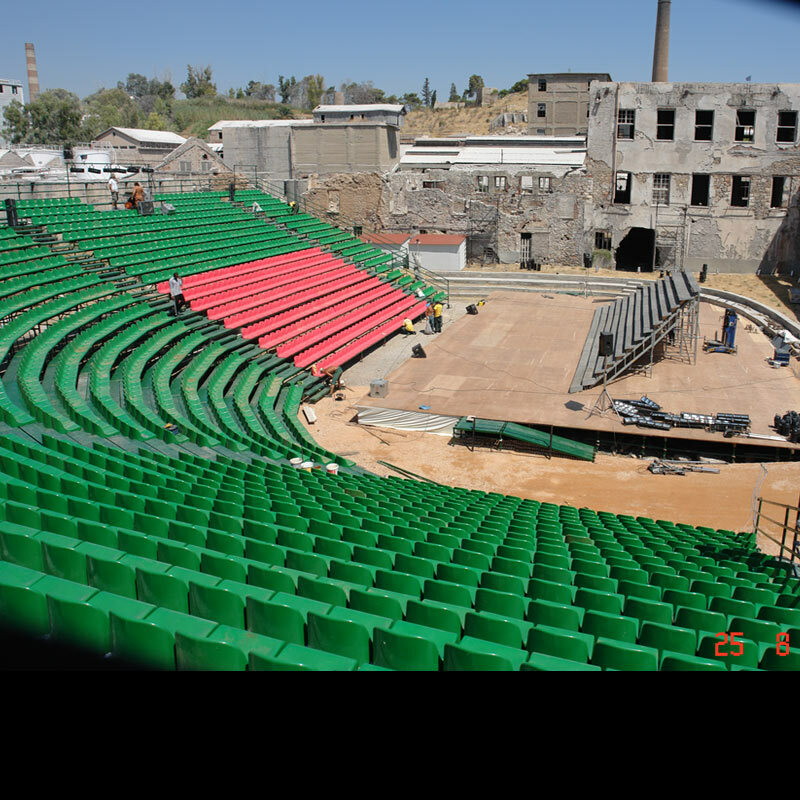 © 2016 C. HOUNTOUMADIS S.A.